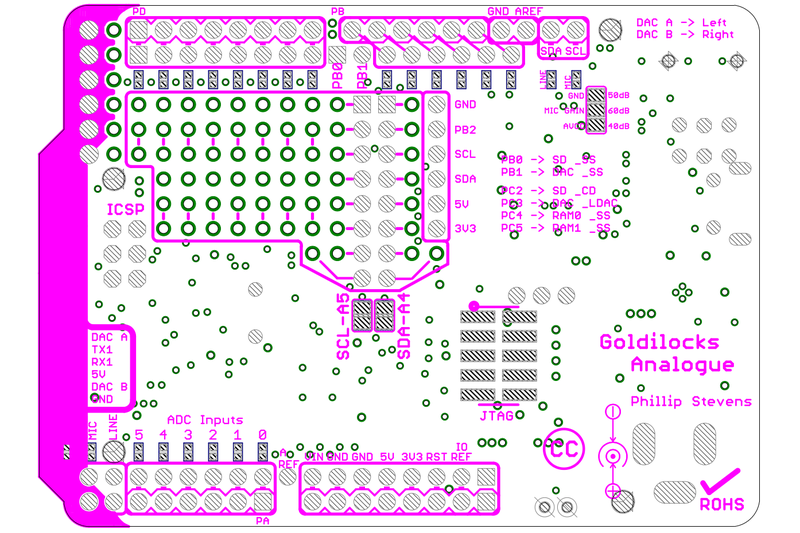 Last time I designed a Goldilocks board, it was because I was unhappy about the availability of a development platform that was within my reach; a tool to enable me to continue to learn about coding for micro-controllers. This Goldilocks, let us call it Goldilocks Analogue, it is not about what I think is necessary, but more about what I’d like to have. The focus is not so much about the basics of SRAM and Flash, but much more on what functions I would like to have, and using my own means to get there. 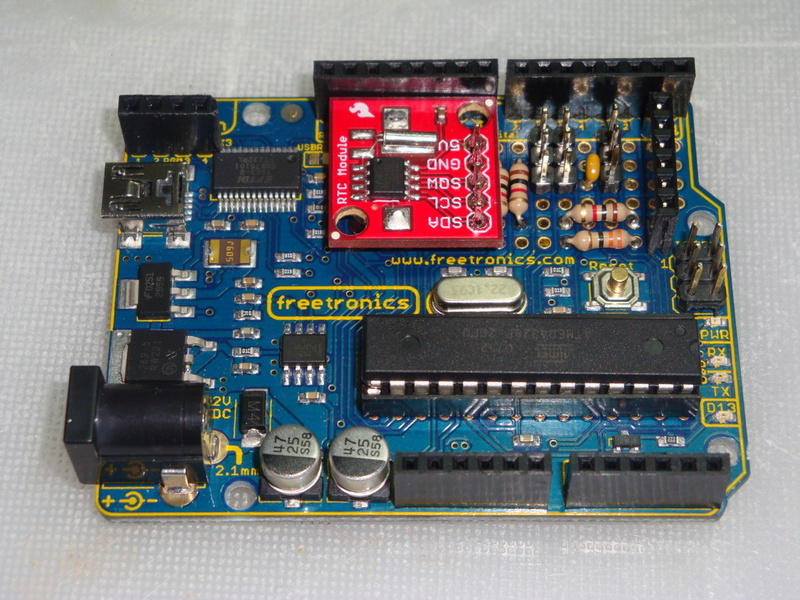 Also, as the original Goldilocks is sold out, Freetronics are considering making their own version. Please add your wishes here. Test results are in. 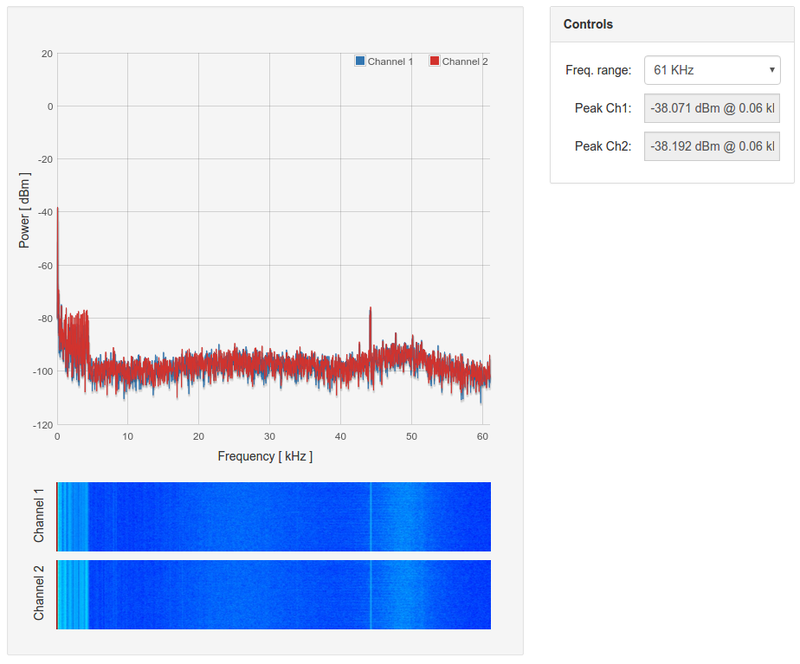 Check out the detailed post on Goldilocks Analogue – Testing. 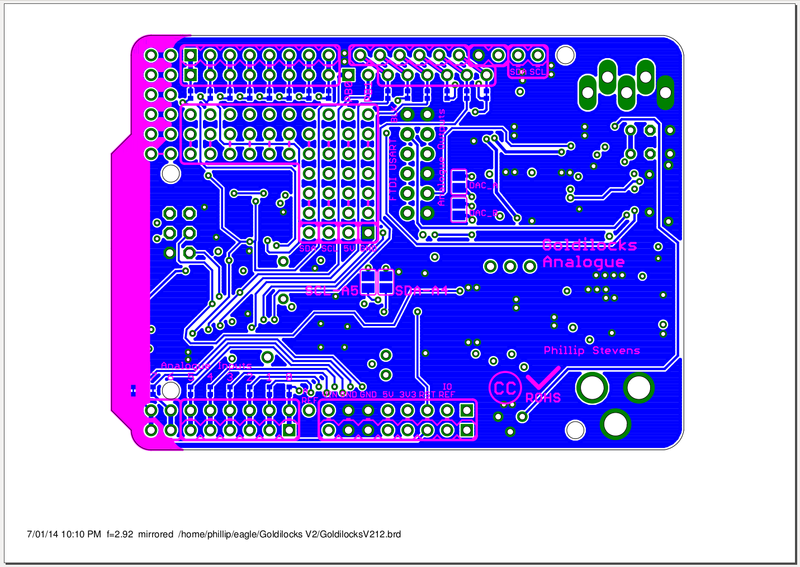 Following the testing, I’ve redesigned the analogue output section to make it much more capable. It now support simultaneous AC and DC outputs, with an application specific headphone amplifier device to provide AC output, and high current OpAmp to provide DC output. 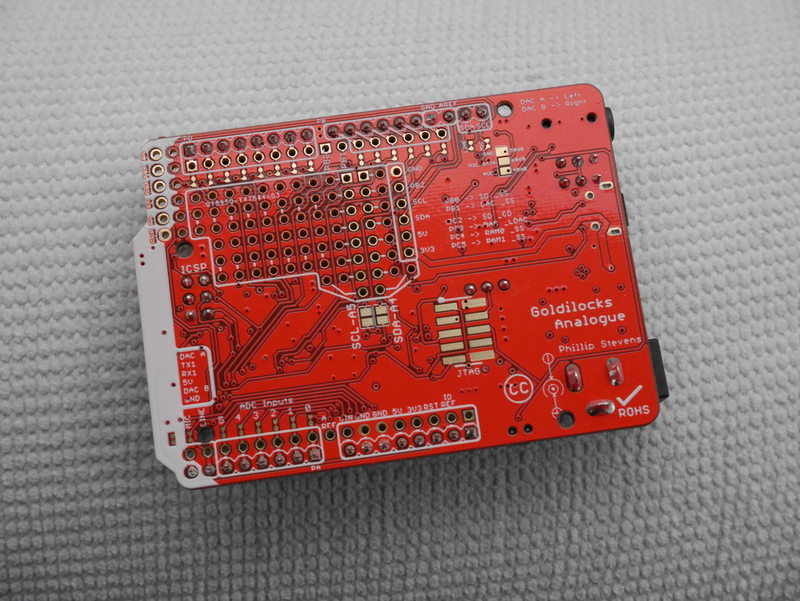 The Goldilocks Analogue Prototype 4 has been designed, and is now being produced. 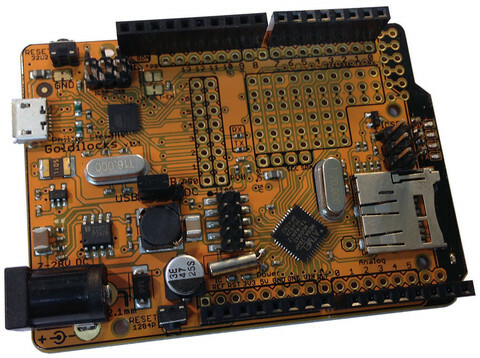 The Goldilocks Project was specifically about getting the ATmega1284p MCU onto a format equivalent to the Arduino Uno R3. 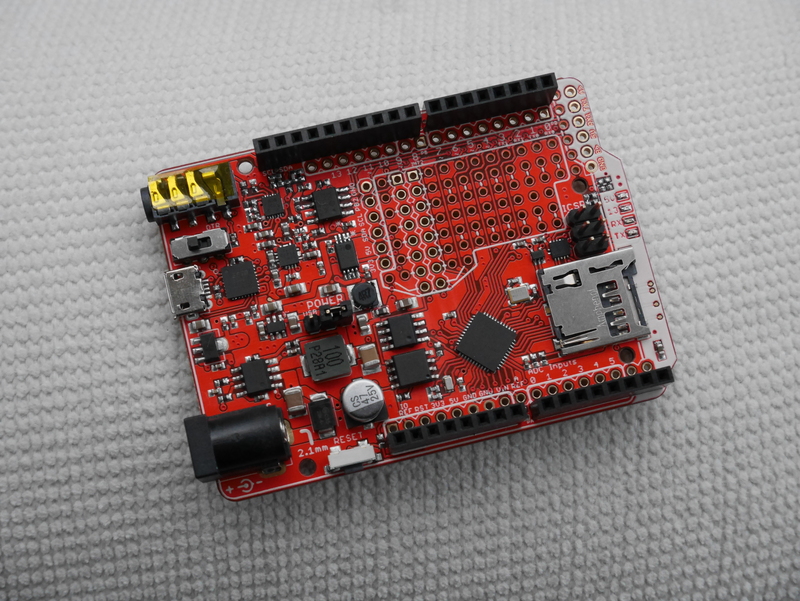 The main goal was to get more SRAM and Flash memory into the same physical footprint used by traditional Arduino (pre-R3) and latest release Uno R3 shields. 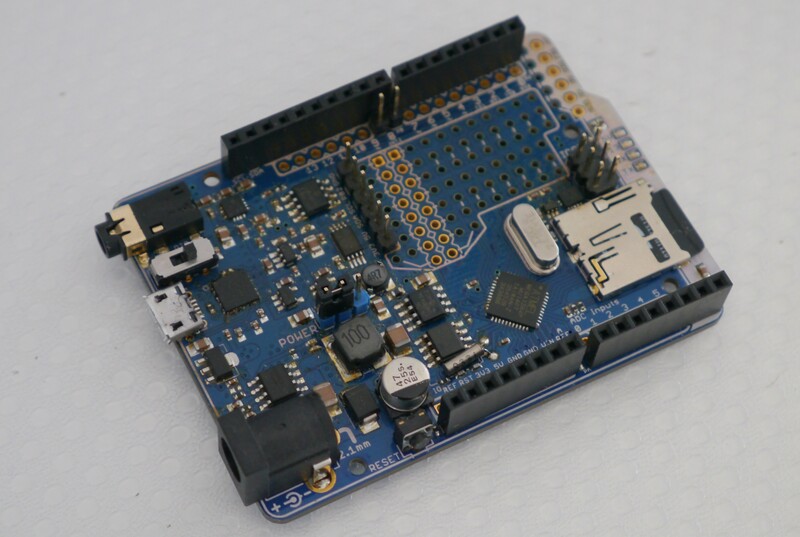 I also tried to optimally use the co-processor ATmega32U2, (mis)utilised by Arduino purely for the USB-Serial functionality, by breaking out its pins, and creating a cross-connect between the two MCU to enable them to communicate via the SPI bus. Whilst the Goldilocks achieved what it set out to do, there were some problems it created for itself. Firstly, the ATmega family of devices is really very bad a generating correct USART baud rates when their main frequency doesn’t match a multiple of the standard USART rates. Engineers in the know select one of these primary clock rates (for example 14.7456MHz, 18.432MHz, or 22.1184MHz) when they’re planning on doing any real Serial communications. 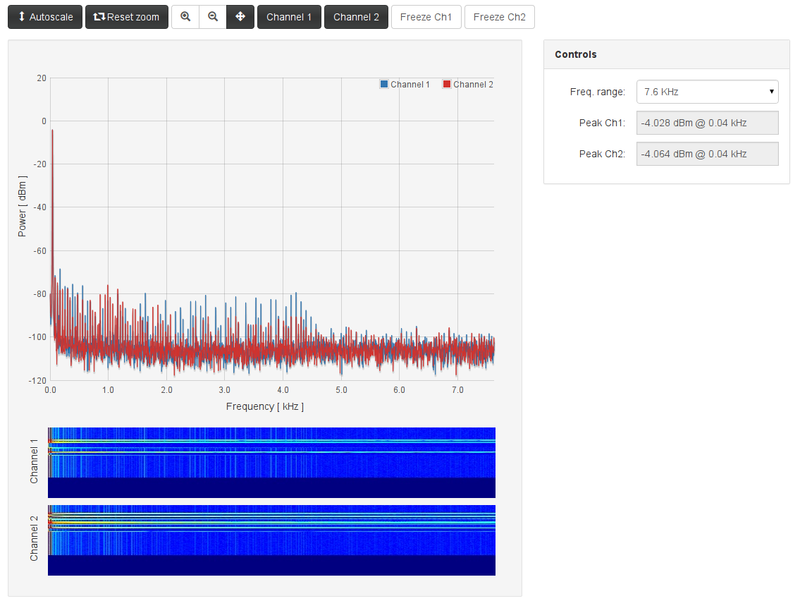 Unfortunately, the 16MHz clock rate chosen by the Arduino team generates about the worst USART timing errors possible. 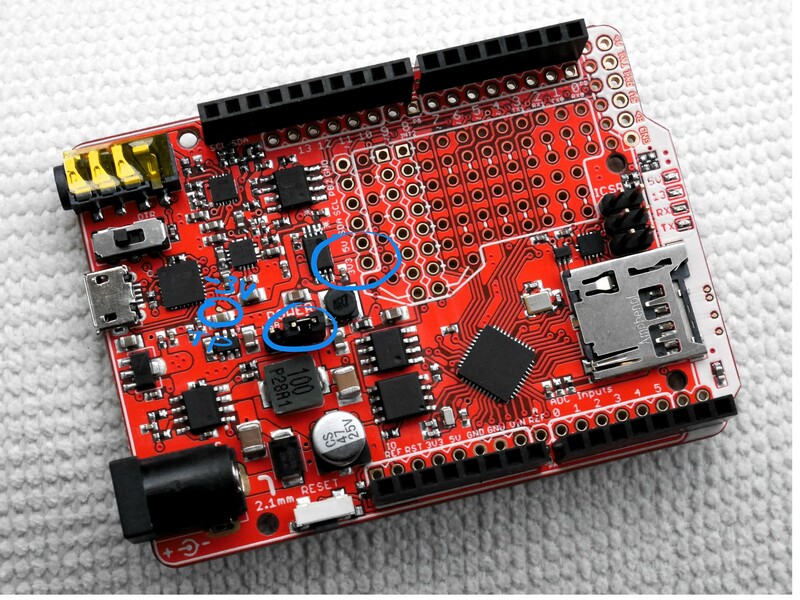 This means that the Arduino devices can only work at 16MHz while programming them with the Serial Bootloader, otherwise programming is bound to fail, due to losing a bit or two due to the clock rate error. Secondly, although having an integrated uSD card cage on the platform is a great thing, using a resistor chain to do the voltage conversion is nominally a bit problematic. The output pins (SCK, MOSI, CS) are permanently loaded by 3k2 Ohm and an input pin (MISO) high signal generates only 0.66 of Vcc, which only just clears the minimum ATmega signal high level of 0.6 Vcc. Neither of these issues prevent the uSD card from working, and the voltage divider resistor chain takes almost no space on the board. But still it is not perfect. Thirdly, there are some minor oversights in the V1 build that I would like to correct if possible. 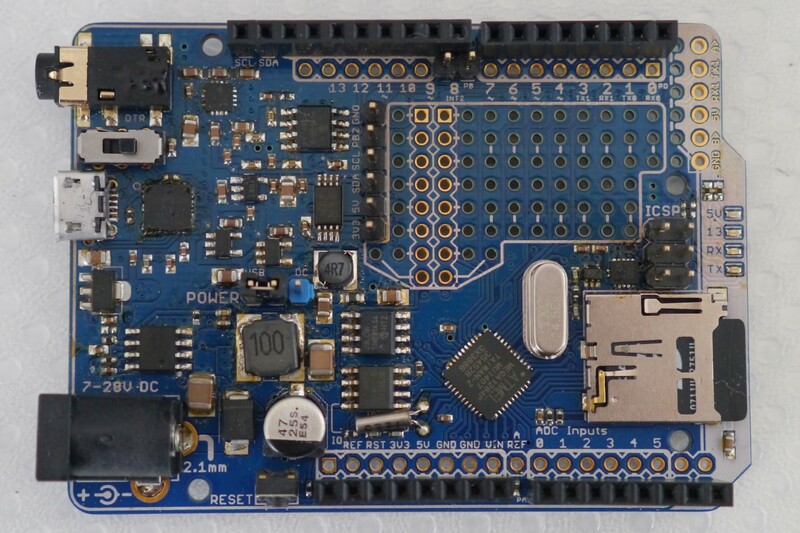 I’ve been toying with the idea of building an Xmega board, in Arduino Uno R3 format, because of the significantly enhanced I/O capabilities of this MCU including true DAC capabilities, but I’ve not followed up for two reasons; the Xmega has no history of use by hobbyists as there is with the ATmega devices, and it doesn’t bring any advantage that an ARM MCU wouldn’t otherwise do better and faster. 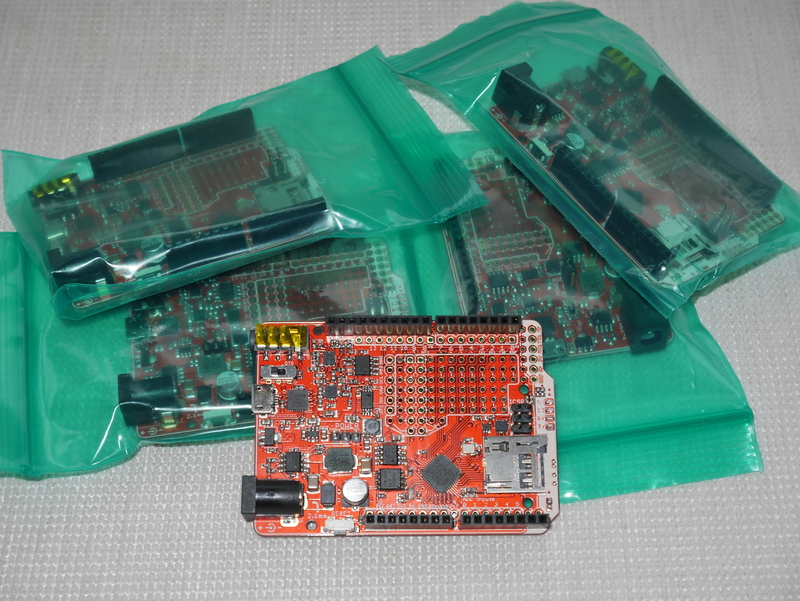 Never the less, the ATmega platform still lacks one thing that I believe is necessary; a high quality analogue capability. The world is analogue, and having an ADC capability, without having a corresponding DAC capability, is like having a real world recorder with no means to playback these real world recordings. 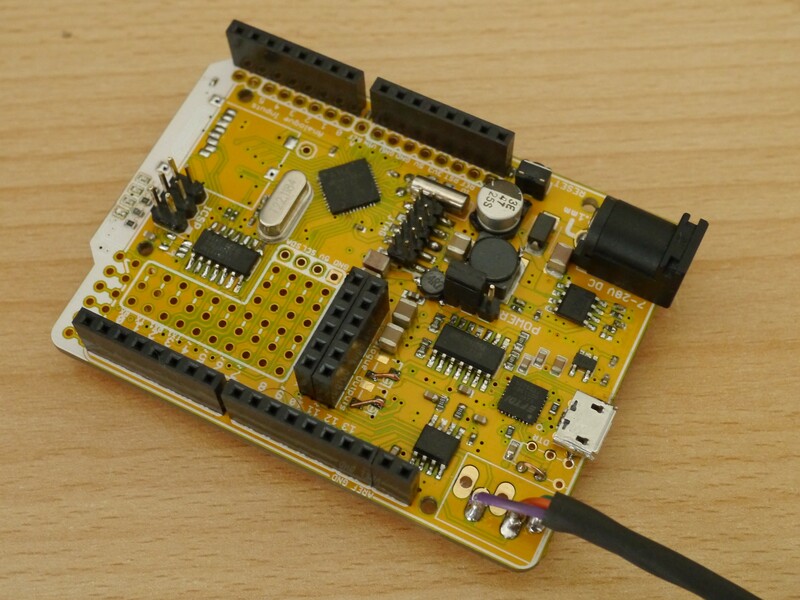 A major initiative of the Goldilocks is to bring an analogue capability to the Arduino platform. So this device will be called the Goldilocks Analogue. 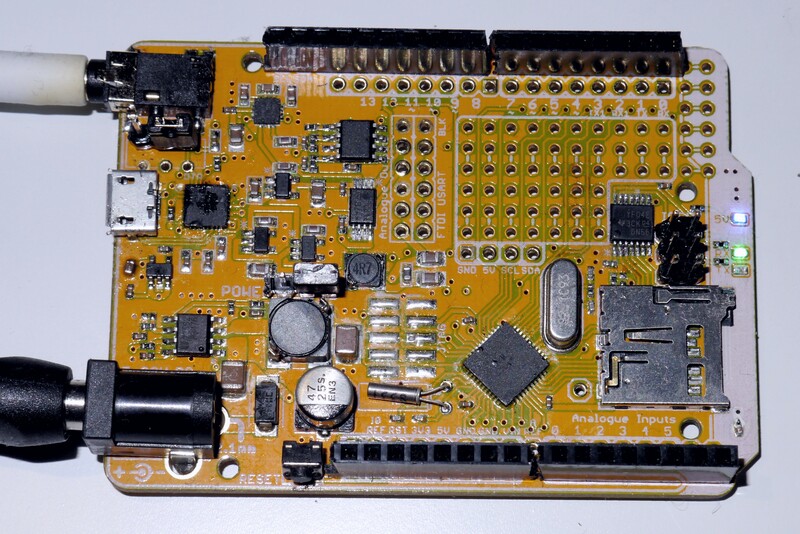 There have been music shields and audio shields built before, and the design used is closely aligned to the original Adafruit Wave Shield, but I’ve not seen dual high quality DACs with both AC and DC capability, integrated onto the main board of an Arduino previously. So that’s where I’m going. The goal is to be able to produce a DC referenced signal, from 0Hz up to around 100kHz, that can provide a binary-linear representative voltage (with sufficient current) to enable a control system, as well as to produce the highest quality audio, with very low noise and THD buffer amplifiers, that the basic AVR platform is capable of producing. 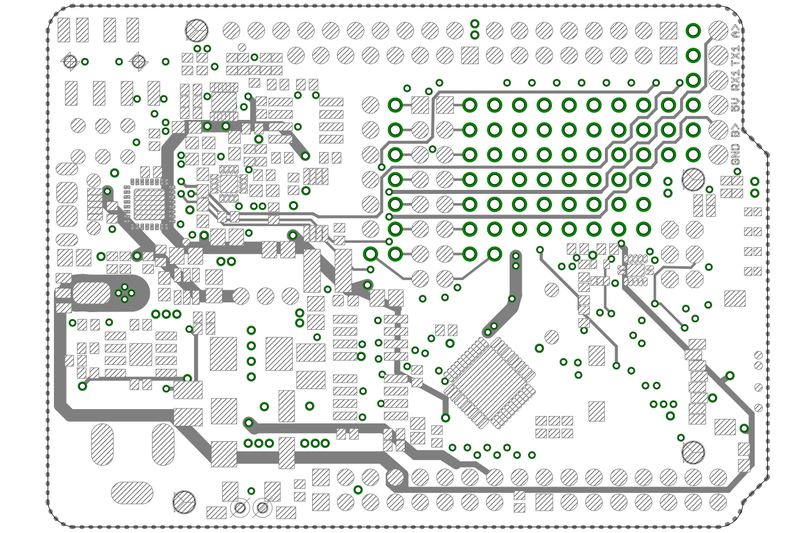 I used to look at Eagle (Kicad, etc) with healthy scepticism. Yeah, not something that I’d be able to learn, but in the process of realising the Goldilocks Analogue, I have learned that it is far easier to learn a new skill than it is to guide someone in India or Malaysia, who doesn’t even get the start of what I want. The old idiom, if you want something done right, you’ve got to do it yourself. There is a “Fremium” version of Eagle available, which is enough to get started. 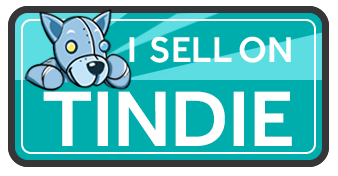 I’m going to try to get a “Hobbyist” version as soon as the paperwork is through. So all this below is my first Eagle project. I’ll talk through each item in the schematic, particularly those things which are novel in the Goldilocks Analogue. 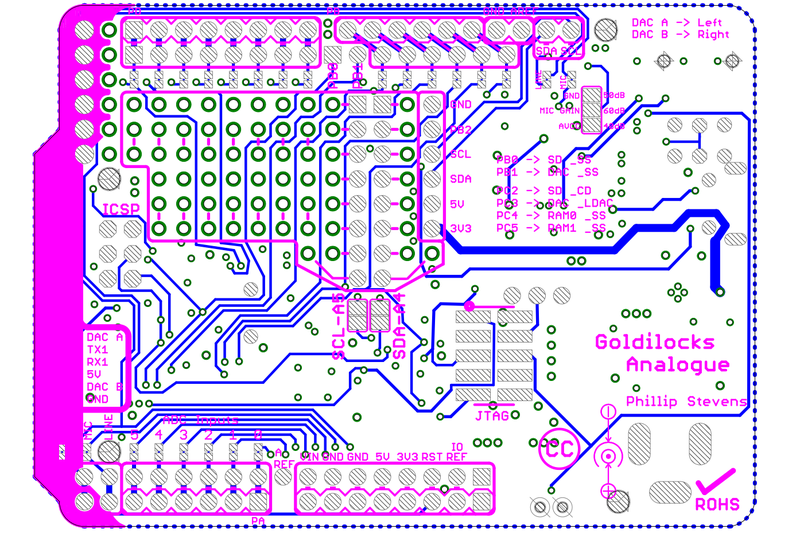 The schematics for the Goldilocks V1 can be found in the User Manual. 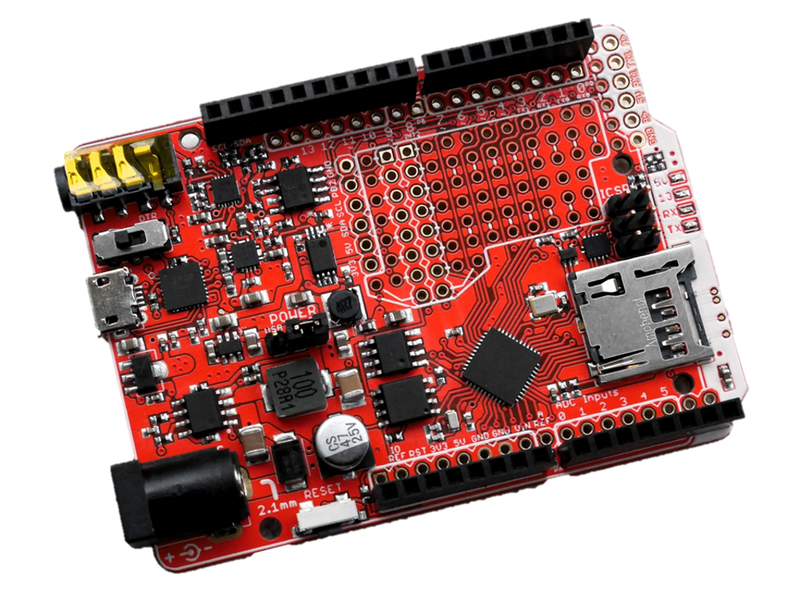 The FT232R is the same device used in countless earlier Arduinos, such as the Duemilanove, and in USB-Serial adapters everywhere. The drivers for all major operating systems are widespread and there is no magic required. 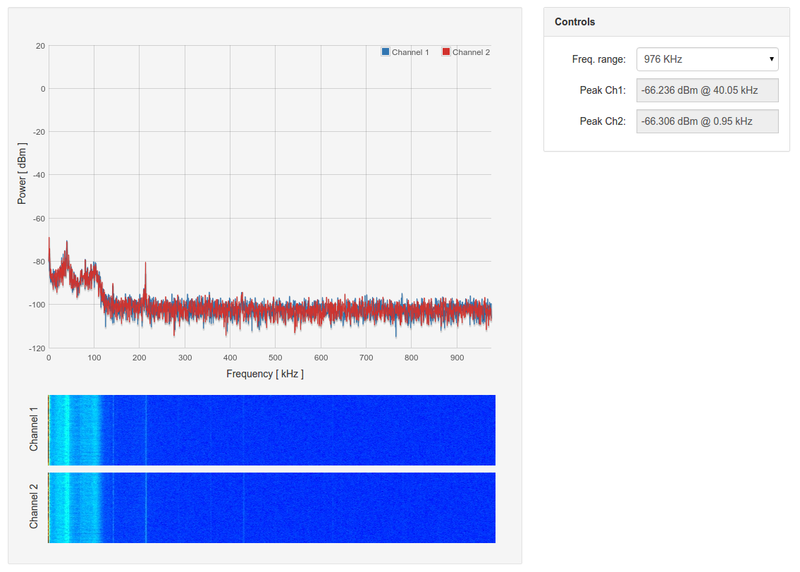 Importantly, the FT232R chip generates a real USART baud rate, at any speed from 300 baud to 3 Mbaud. Unlike in the Duemilanove I’m using the FT232RQ chip, which is in the QFN package. There is too much going on to take up the board space with the larger package. I’ve added a switch to disable the DTR Reset functionality of the Arduino and Wiring Bootloaders. Often, I would like a running device NOT to be reset by plugging the USB cable, but then I’ll be using the Goldilocks in another thing where I do want this to happen. Having a switch, like Seeed often do, is the best answer. 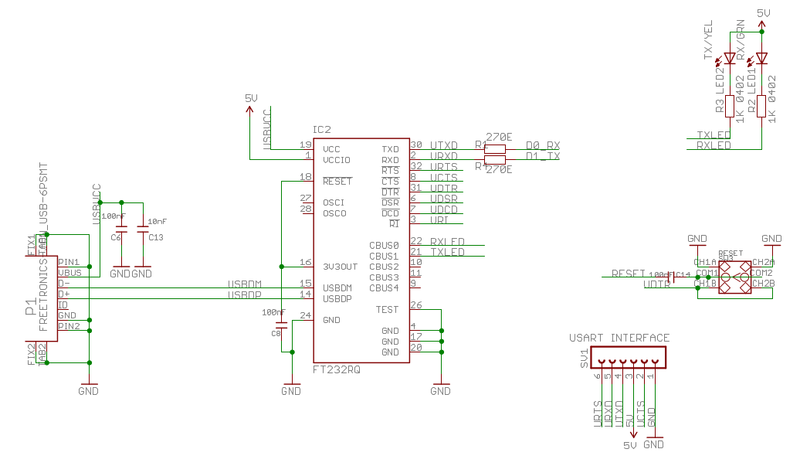 Also, I’ve added a 6 pin connector replicating the standard FTDI pin-out, to enable the FT232RQ to communicate with other devices, should this be necessary. It would be a shame to lock it into the board, with no option for extension. In designing the buffer for the uSD, I was trying to achieve two things. 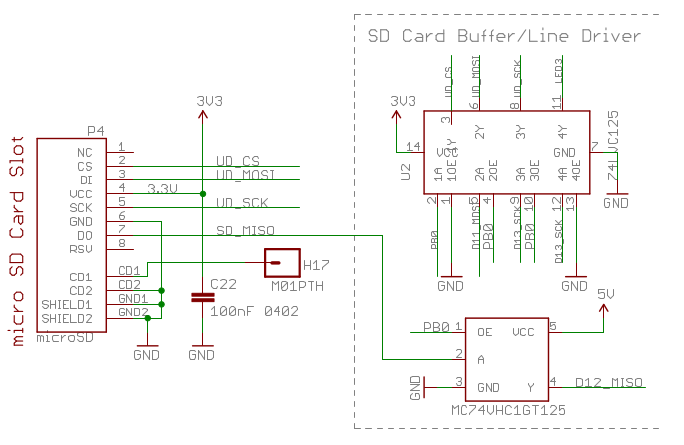 Firstly, isolate the uSD card entirely from the SPI bus when it was not in use. By isolate, I mean over 1MOhm resistance. 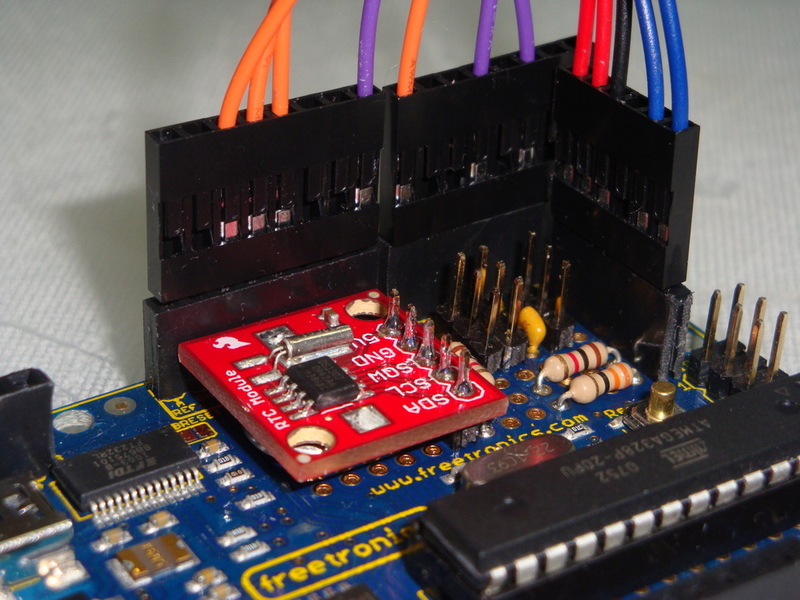 This isolation ensures that the uSD card doesn’t load up the SPI pins at all, when the uSD is not being used. Secondly, I was trying to ensure that each end of the SPI bus receives the correct voltages and currents to ensure maximum throughput. The two devices selected achieve both goals as desired. 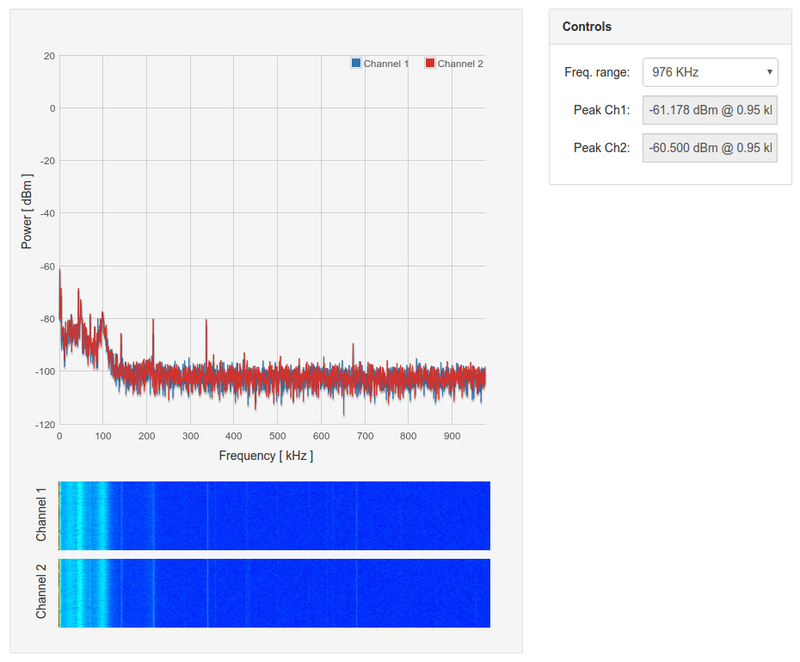 For the MCU to uSD direction (SCK, MOSI, and CS) I’m using a 74LVC125 in quad package. This package is tolerant of inputs at 5V rising above its Vcc of 3V3. The output enable on low, is connected to the Chip Select line, which means that the uSD card will not be driven unless the CS line is low. It always presents a high impedance to the MCU. As a quad package the 74LVC125 has one spare gate, which can be used to drive the Arduino LED. This is neat no cost result that entirely removes any loading on Arduino Pin13. For the uSD to MCU direction the buffer has to effectively produce a 5v CMOS high when receiving a 3V3 CMOS high. The best way to do this is to use a device that is TTL signal compatible. 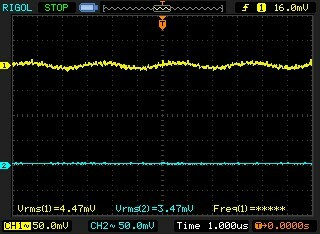 The TTL minimum high signal is only 2V, much lower than the CMOS minimum high signal of 2/3 of Vcc, and importantly below the worst case of 2/3 of 3V3 CMOS. The only device I could find with the required characteristic of accepting TTL inputs with a low output enable, is the MC74VHC1GT125. I’m sure there are other options though. This is the fun stuff. Analogue… the real world. As noted above, the goal is to produce two binary-linear signals with enough buffering that they can drive a reasonable load (such as small headphones or an audio amplifier) and produce a constant voltage under a number of power supply options. 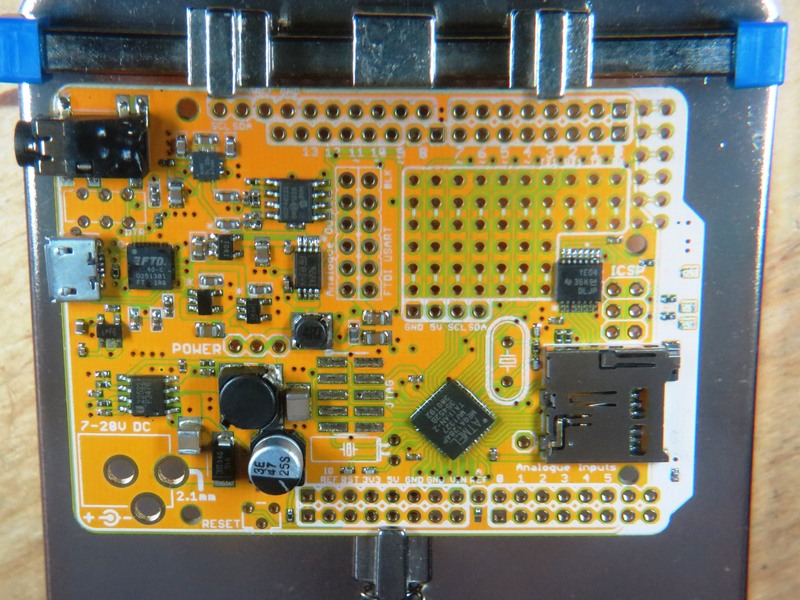 The inspiration for the circuit came from the Adafruit Wave Shield, but there are a number of significant improvements that are worth noting, not least the use of a dual DAC, for two channels of output. Firstly, if you want to get a very low noise output, whilst using a high current Switch Mode Power Supply, it is necessary to filter the supply voltage. I’ve utilised the dual steps of an L-C primary filter, followed by a ferrite core bead secondary filter. I’m not sure whether this is all necessary, and I’ll be testing the circuit later with various components removed to check their efficacy in the role, but if they’re not designed in now they never will be added later. 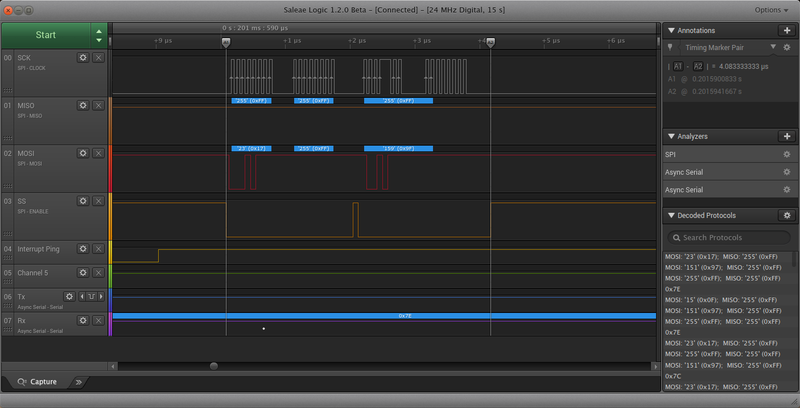 I’m using the Microchip MCP4822 DAC to produce the raw output voltage. 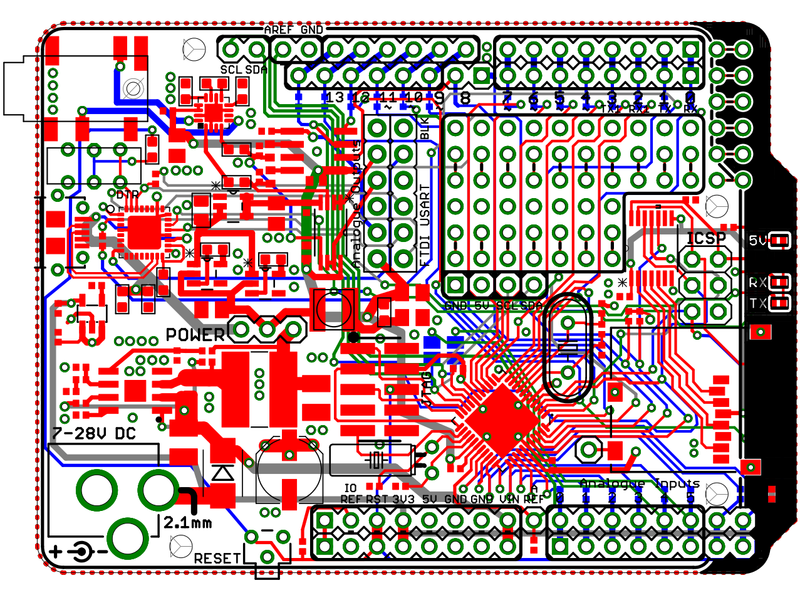 This is an SPI device which will be selected using the other “spare” Goldilocks digital pin PB1. Using PB1 to signal the DAC means that none of the Arduino R3 pins are used for on-board Goldilocks functions, and as both CS lines (PB0 and PB1) are tied high they will ensure that all these on-board devices stay off the SPI bus during system reboot. 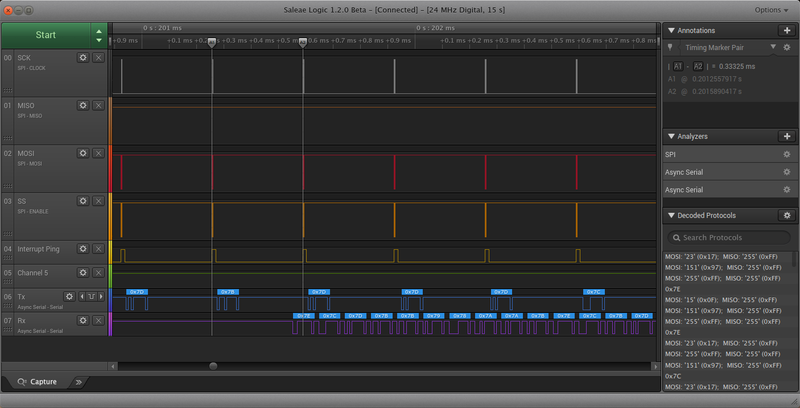 The MCP4822 takes 16 bits to set a signal level, this is two SPI bus transactions. 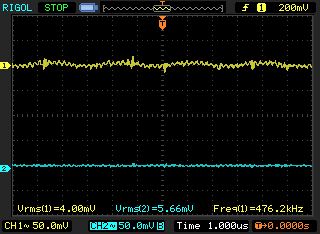 The maximum SPI rate is SCK/2. Therefore, if my Goldilocks is doing nothing else, it can generate 691,200 SPI transactions per second. 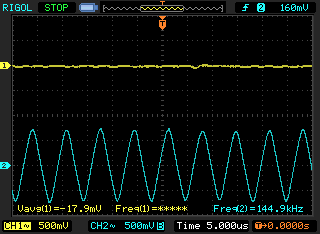 If both DACs are being driven we can generate a square wave of 172,800Hz. This is an unreachable figure. 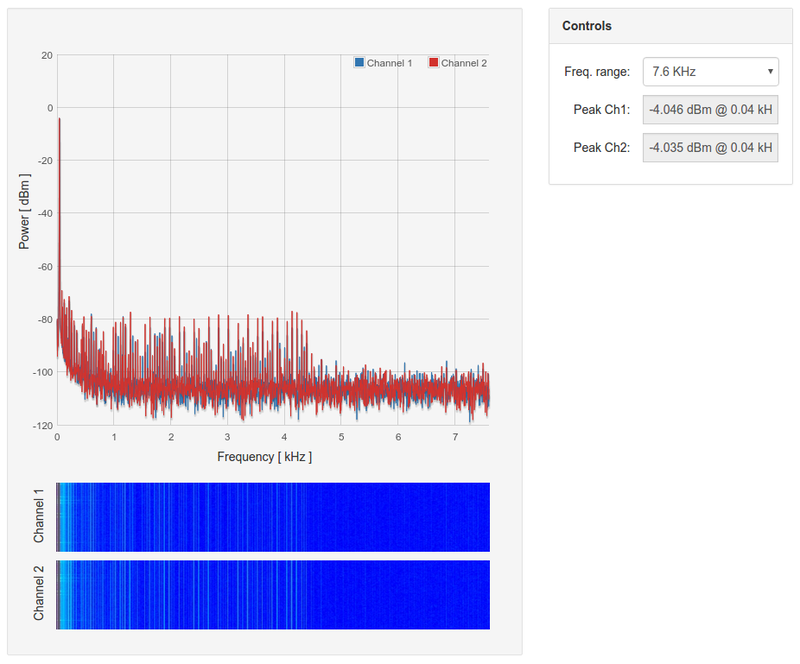 More likely, the best case will be around 50kHz for both channels, or 100kHz if only one DAC is being used. Optionally, the LDAC pin-out can be used to synchronise the transfer of digital inputs to the analogue output buffers across the two DACs or to a specific clock with low jitter. Unlike the Adafruit solution, the MCP4822 generates its own internal 4.096V reference voltage Vref. This means that irrespective of whether the Goldilocks Analogue is being powered by a battery, by USB, or by the barrel connector and the SMPS, the output voltage for a particular digital input will be constant. The op-amp configuration with dual op-amps, in a quad package, designed to double the current capability of the output, has raised concern from all who see it. Concern was my initial thought too. However after some research, I found it to be a recommended configuration for current doubling. The only difference to the Adafruit example circuit is to add low value output resistors which allow each op-amp to find its own offset level without consuming excess current. I have added the option to bridge the output capacitors to provide a DC output. The output capacitors are necessary for audio use, as headphones or audio amplifier inputs require an AC connection, with no DC offset. 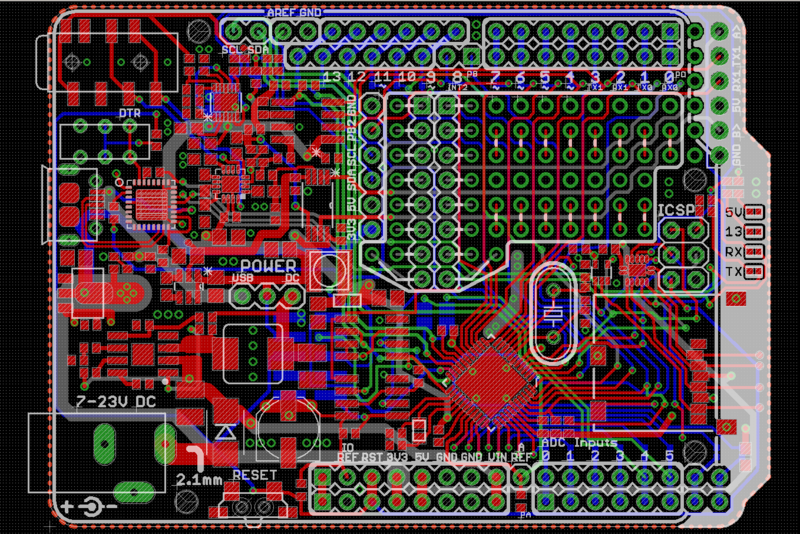 It takes many hours to layout even a small board the size of an Arduino Uno. Luckily, I had a completed and fully functioning example to use as a platform, thanks to Jon’s prior work on Goldilocks V1. 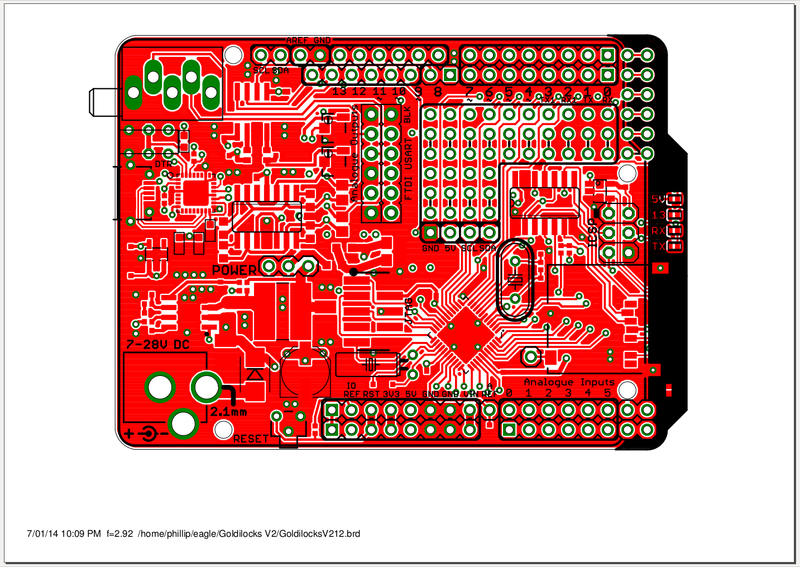 The final prototype board layout is now done, and the board design sent off for manufacturing. 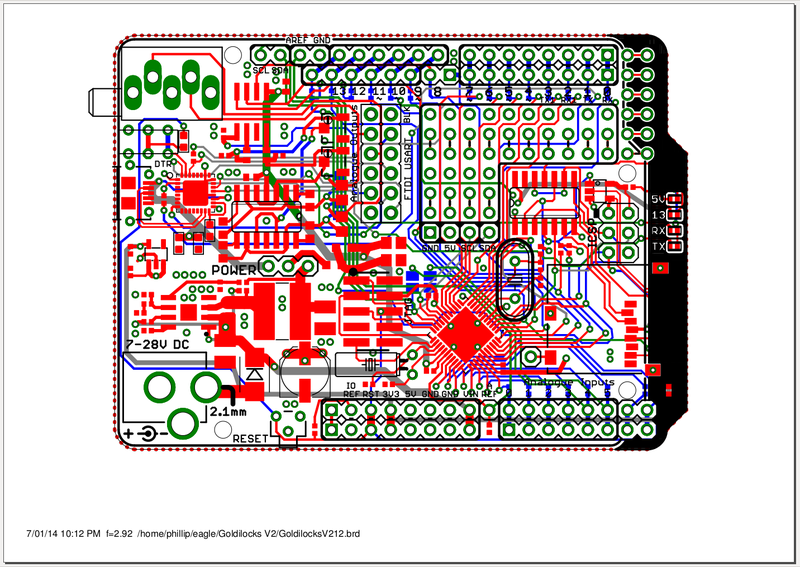 In this layout, I’ve been able to retain most of what makes a Goldilocks; the ATmega1284p, the complete dual rows of header pins arranged in pin-logical order 0-7, bridging of the I2C pins to A4/A5, JTAG, and a high current power supply. Added to this now are the three items described above; the FT232RQ and Reset switch, buffers for the uSD card, and the analogue platform. 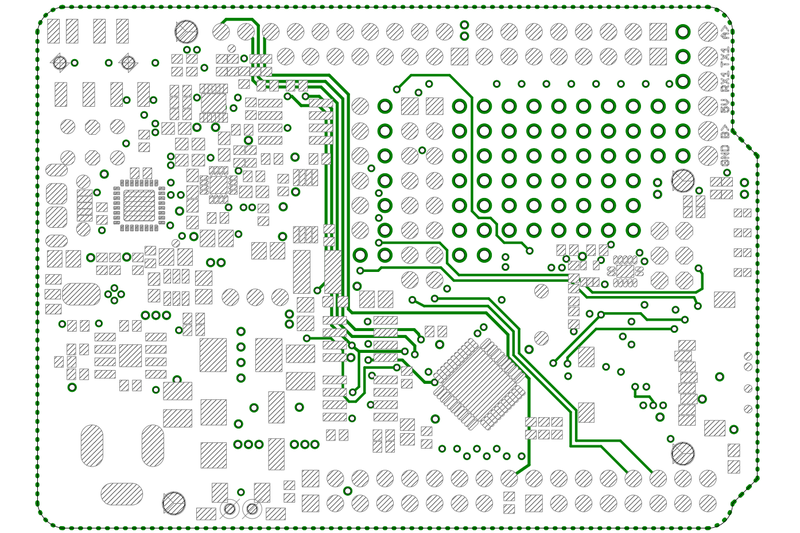 Starting in the bottom left, the SMPS has been relaid to significantly shorten the high current paths around pins 2, 3, and 4. 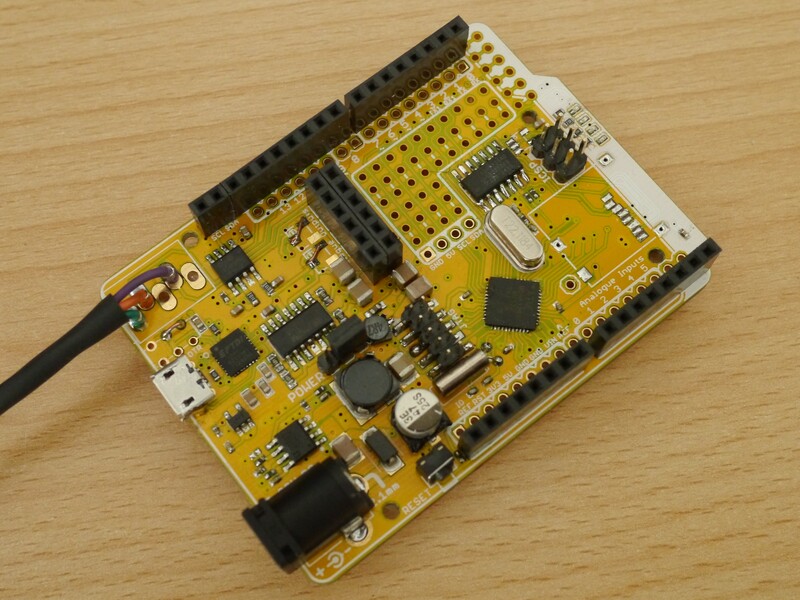 This will reduce the circuit noise, and taken togther with the effort to create solid ground planes, and specific AVcc filtering, will help to ensure the minimum of power supply noise in the analogue platform. 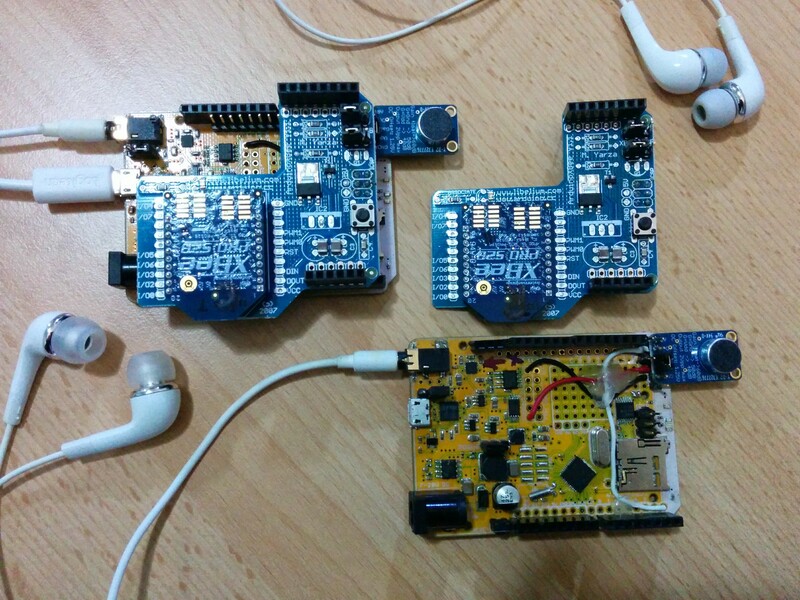 On the right we can see the uSD buffers, which have eaten into the prototyping space significantly. 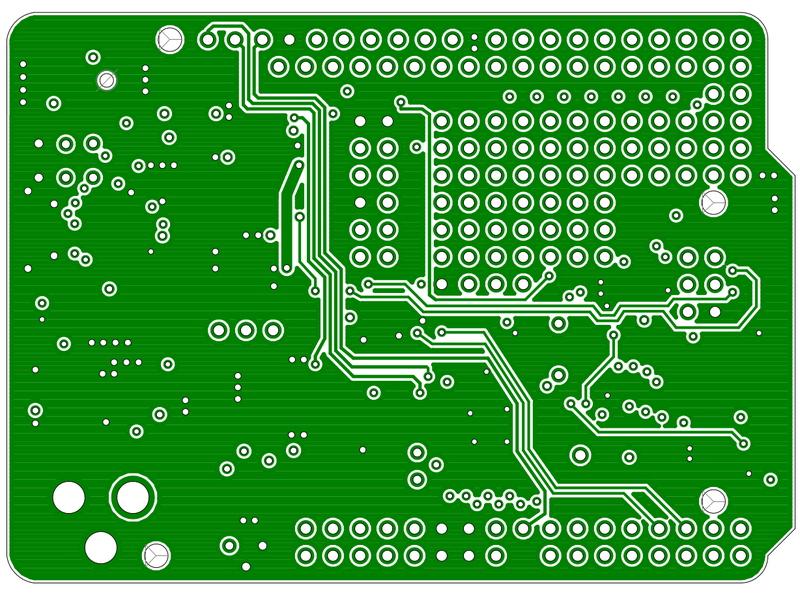 Although the signals will be much nicer than with a resistor bridge, the cost is clearly on space. If the Goldilocks Analogue ever goes into production the SOIC package buffer chip will be replaced by a QFN package, and some space should be recoverable. 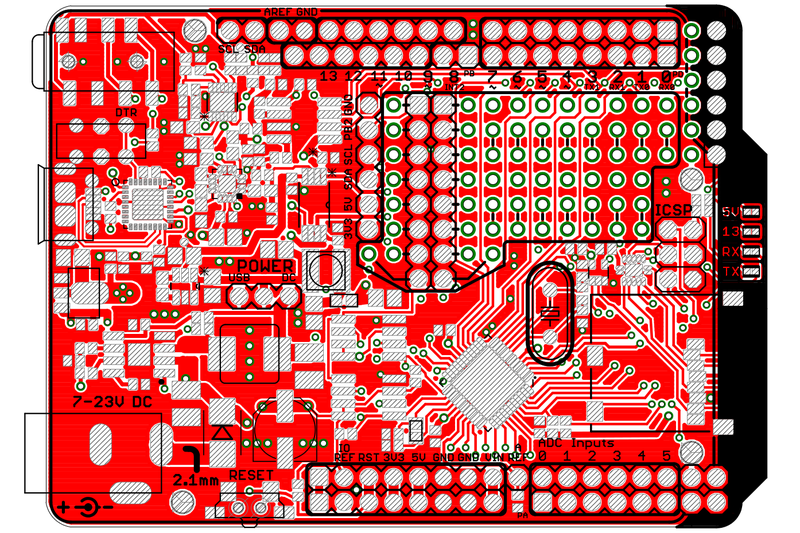 Finally, the analogue platform is implemented in the top left of the board, to the left of the pin-outs for the analogue platform and the FTDI interface. Below the pin-outs the analogue supply voltage filtering is implemented, with exception to the chip decoupling capacitors which are tied directly to their supply pins. Keeping the analogue lines as short, as balanced, as fat, and as well shielded as possible was a key focus of my design. There are a few USART lines running under the chips, but they are unlikely to produce noise as they are under the first ground plane. 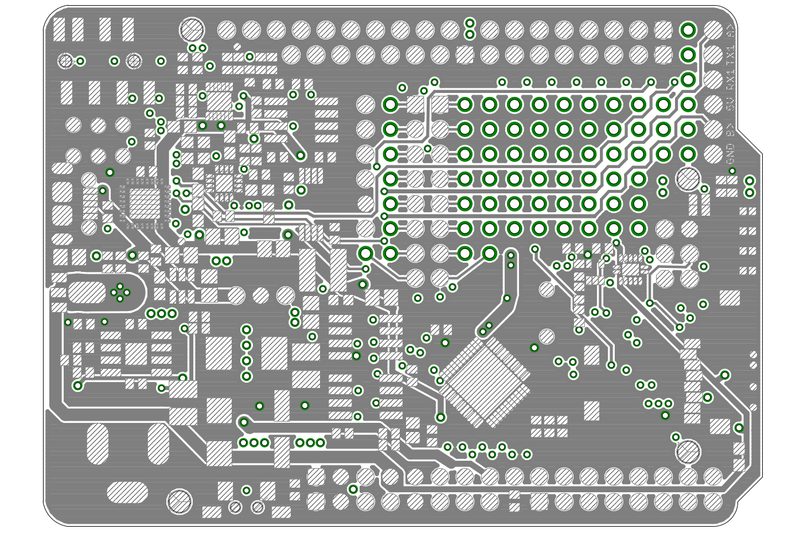 The top layer of the board is pretty crowded. Some tricks such as bridging my lines to get a solid ground plan under the crystal, were passed to me. 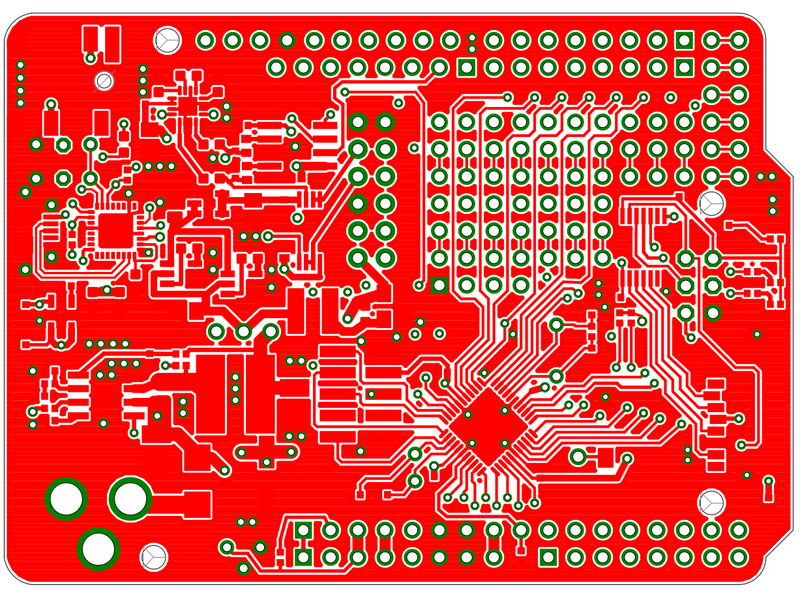 The Route2 or second layer is the ground plane of the board. As such it needs to provide a stable and solid path for currents to return to the origin. I have been able to provide almost solid copper under the entire area from MCU to power supply, and also from the analogue platform back to the central ground point. In the Goldilocks Analogue (as in Goldilocks V1) the Route15 layer is wholely at 5v and is a massive supply line. I’ve used this layer to transport the 3v3 supply around the lower edge of the board, to provide power to the uSD card, and its input buffer. 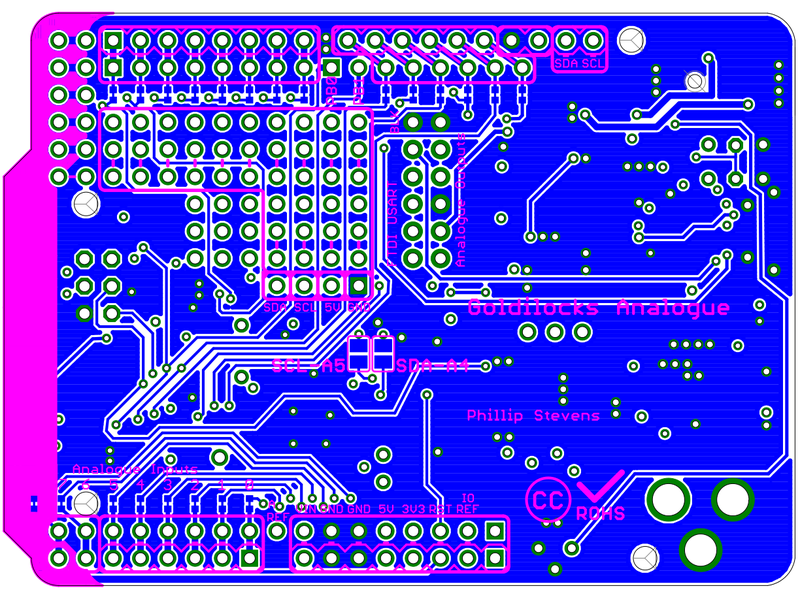 The other thick tracks are the USB input line and the analogue AVcc supply line. On the back of the board, mirrored here, things look as we expect. The previously noted bridge capability for the I2C bus to A4/A5 is there, as is the capability to bridge the DAC A and DAC B output capacitors to enable DC output. 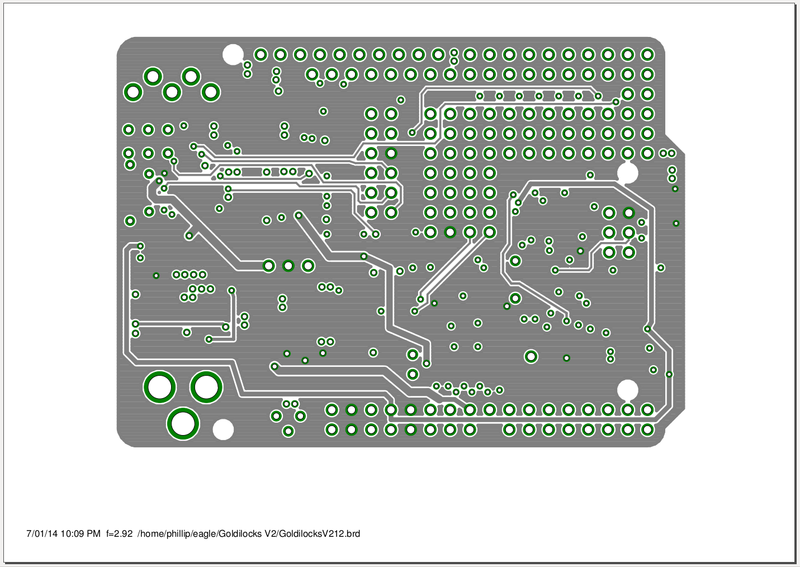 The Goldilocks Analogue prototype board design has been sent to Seeed Studio for conversion into a PCB. 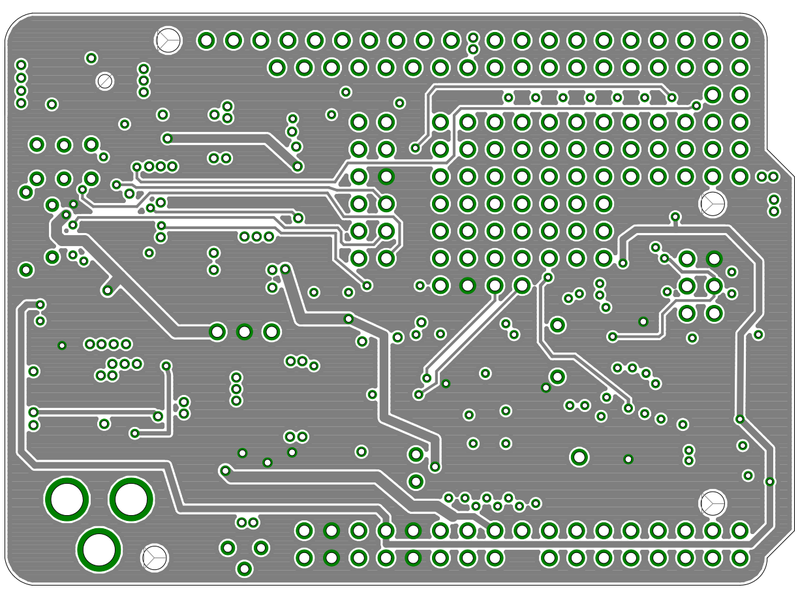 While this is happening I’ll be sourcing components to solder to the PCB. I think the next post will be on this stage of the process. Well I have everything finished and in the interim, until I write a new post, here’s the photos of the final assembly of the prototype at Jon’s SuperHouse. 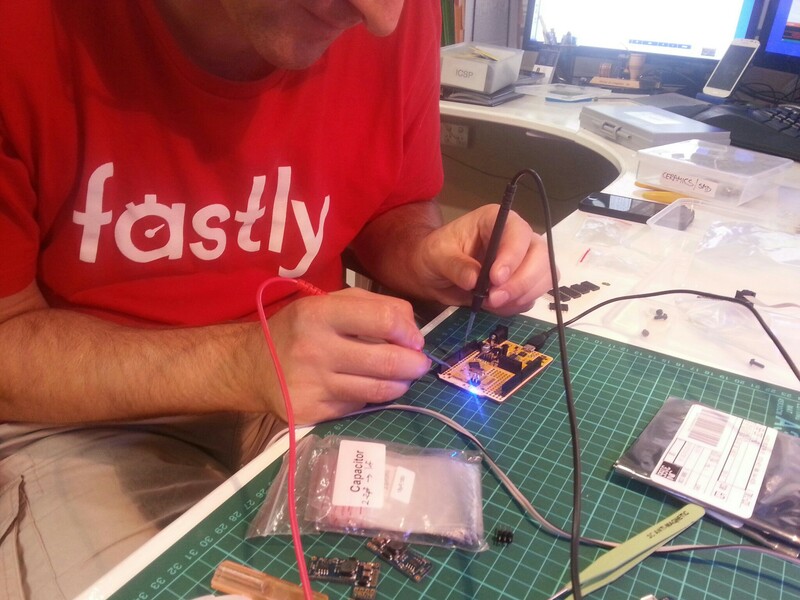 Here Jon is assembling the first prototype, using several faulty Goldilocks v1.1 devices as donor boards. Only two components didn’t fit correctly, and we didn’t have a uSD card cage so that was left off. Out of the toaster oven, and final assembly finished. Just checking that the voltages are as expected across the board. Well I’ve had it on the desk now for two nights, and I’m very impressed that it seems to generally meet the specification that was intended. 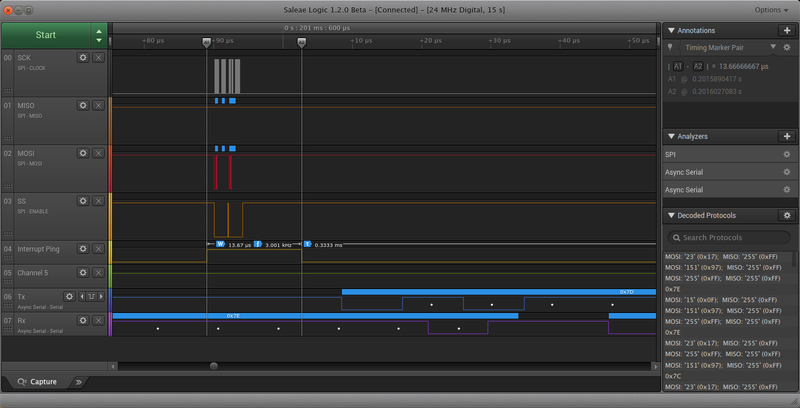 The code for setting the DAC levels is currently only optimised for setting two values at a time. Specifically, it is not a streaming function. Never-the-less, it is possible to achieve the stated goal for both DAC channels. 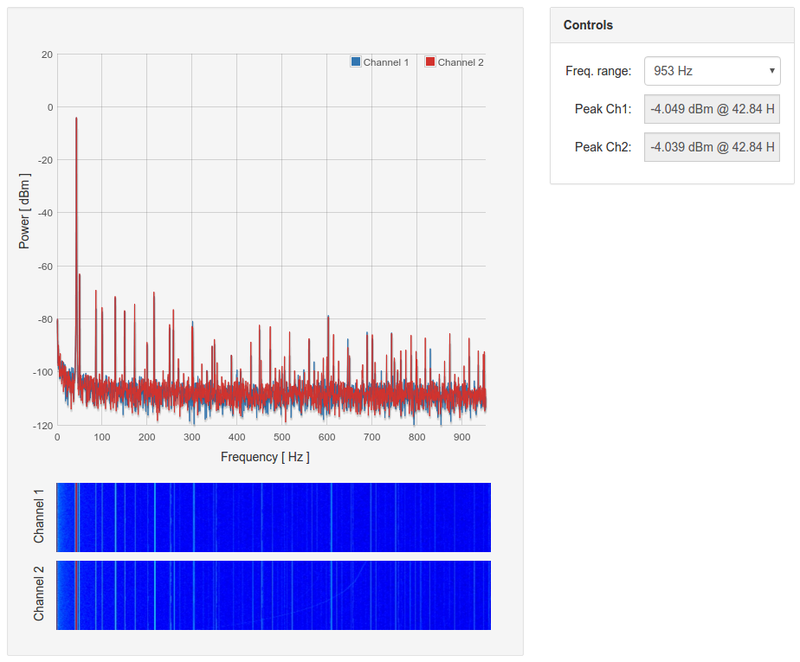 The actual number achieved is 108 kSamples/second, shown below, or 18.8us to transmit 2 samples on 2 channels. 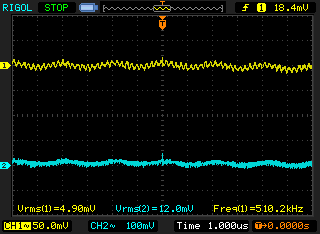 The trace below shows the signals for both DACs at 0x0000, then both DACs set to 0x0FFF. Therefore, we’ll be able to achieve the 44.1kHz sample rate for CD audio, but only 12 bit resolution, with some time time to spare. 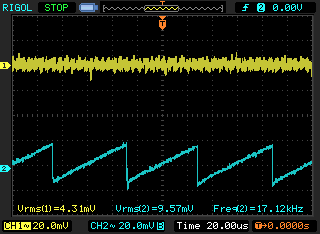 If there is a need to read a uSD card, or do some other processing then it is likely that this rate will be more than halved, as the data would then need to to be read over the SPI bus (the same bus the DAC is using) for example. 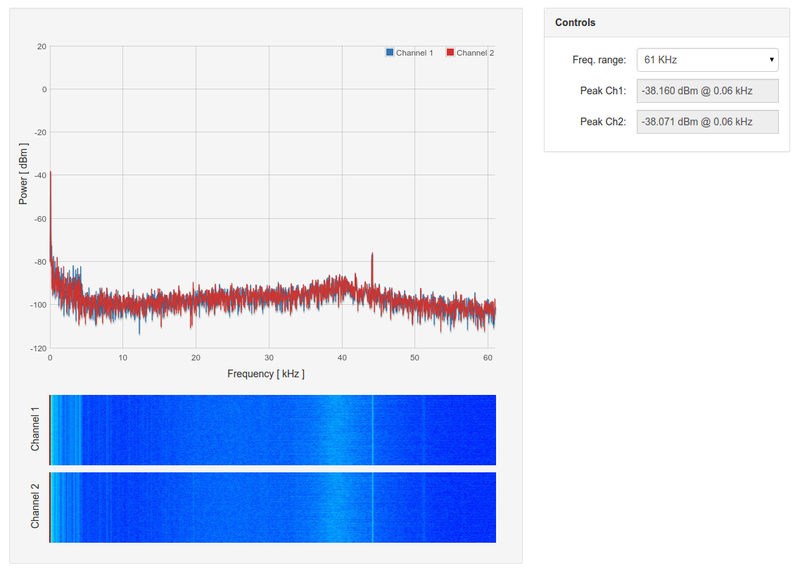 Also, there is a single pole filter between the DACs and the OpAmp buffer, with a 3dB cut-off frequency of 23kHz, which will limit the maximum output frequency but will help to reduce sampling alias issues. 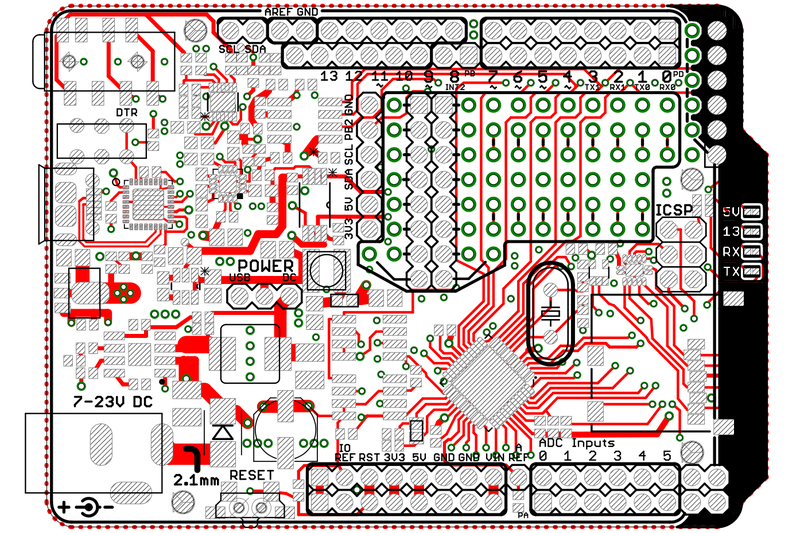 Looking at the board from the top left the MCP4822 can be seen in the SIOC8 package, with the Burr Brown OPA4132 quad op-amp in a SOIC14 package just near the POWER selection jumper. 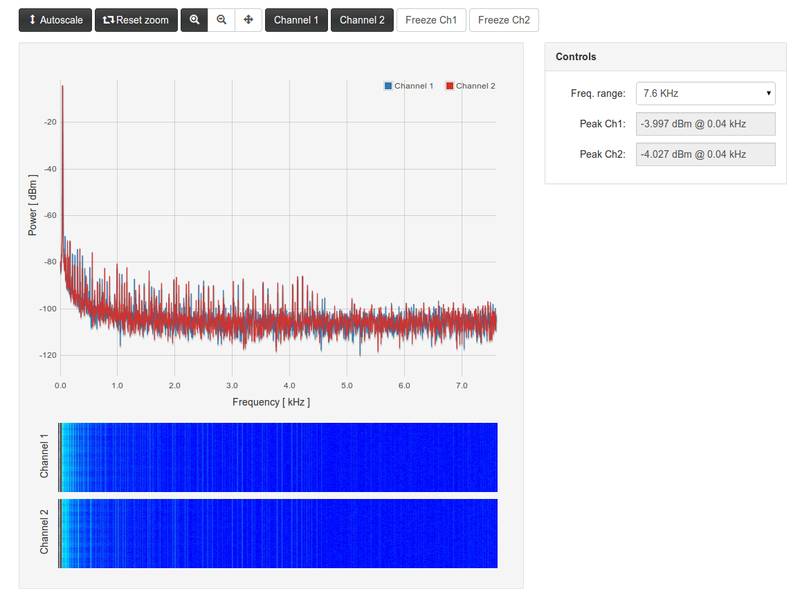 The FTDI FT232RQ USART in QFN package takes up much less space than its FT232RL peer. 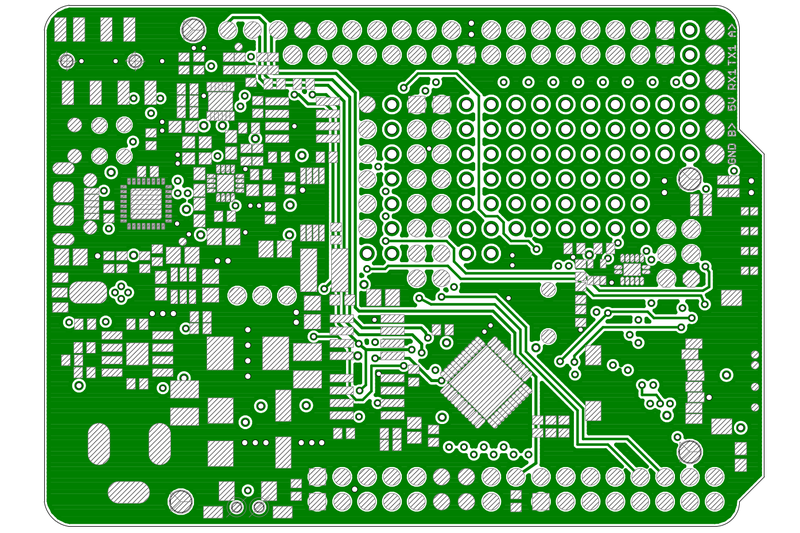 Now the prototype is finished, it is easy to see what needs to be improved. Actually there’s not too much wrong. 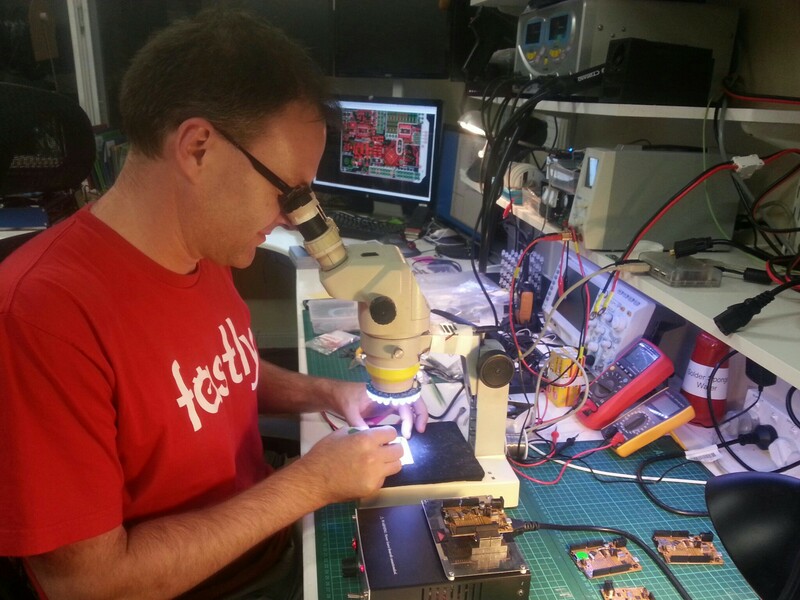 The inductors for the Analogue Vcc have the wrong footprint, so they will need to be fixed. The inductor is too large for the footprint and is snuggled up to the POWER jumper, and the ferrite bead is somewhat too small. I didn’t source the very small 15 turn potentiometers, so they are just shorted out. As is the DTR (RESET) disable switch located near the USB connector. As a final issue, the footprint for the 1/8″ jack was wrong for the supplied connectors, so I’ve just added a short set of jumpers to achieve the same outcome. 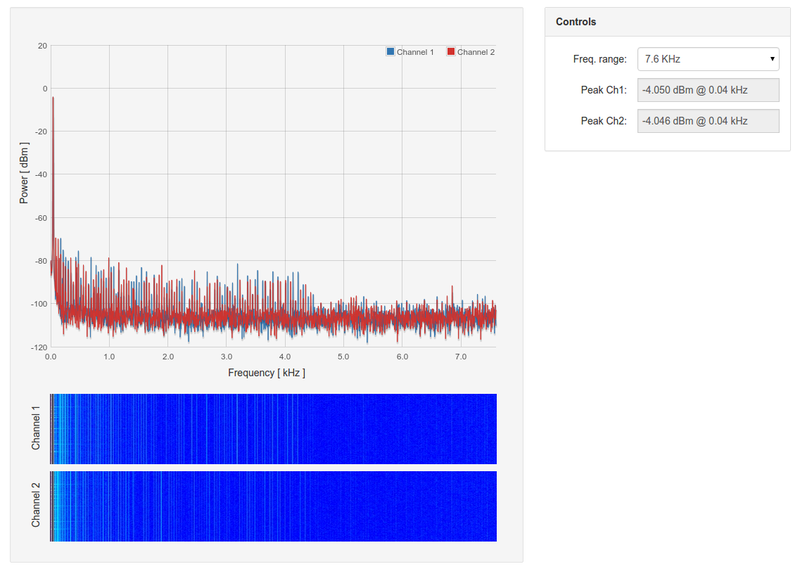 Here is a short video demonstrating a Voltage Controlled Oscillator running at 44.1kHz sampling into dual channels. It sounds a little odd, because one of the channels is inverted, generating an out of phase effect. Well, things are good, and bad. 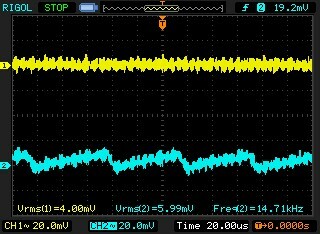 I’ve been testing the DAC stage and found (what I should have known) that I needed an output buffer op-amp able to reach the negative rail (0V) on input and output to support the MCP4822 0v to 4.095V ranging DAC. 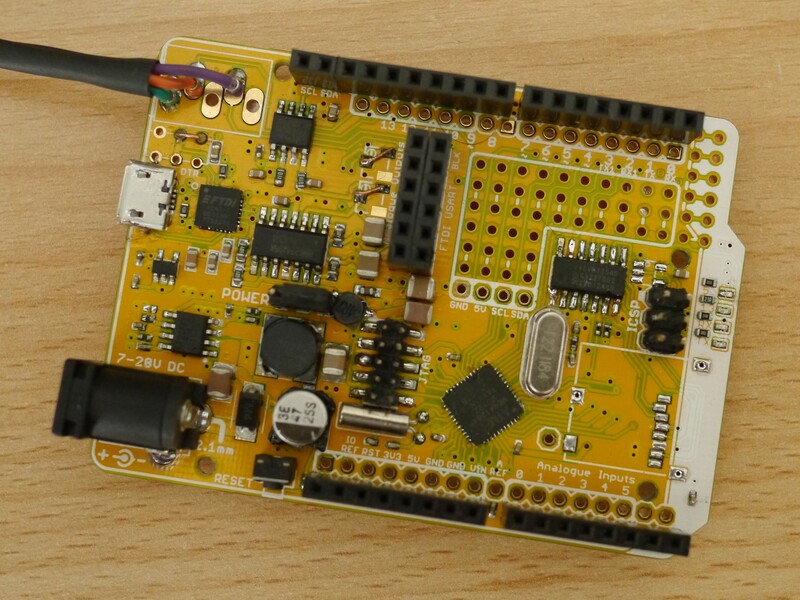 The OPA4132 exhibits noise and instability issues around 0.3V output. Unfortunately the OPA4350 (rail to rail high current), which looks like it will be the right pin compatible device, costs over $10 each, which is nearly as expensive as the audiophile OPA4132 I specified previously. 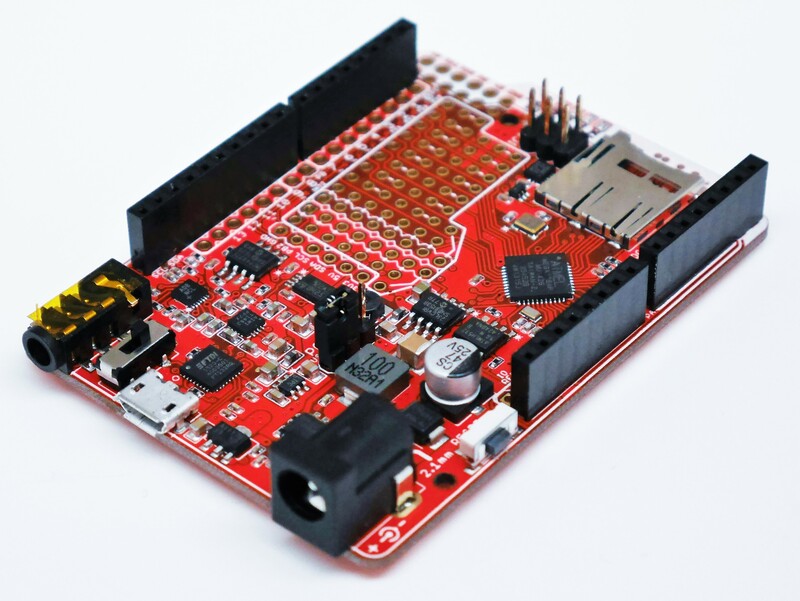 There seems to be a pin compatible alternative, the TS924A, which is about $2 each, but it is several orders of magnitude worse in performance. Is it worth the difference, when working with a 12 bit DAC in the presence of mV of power supply noise? 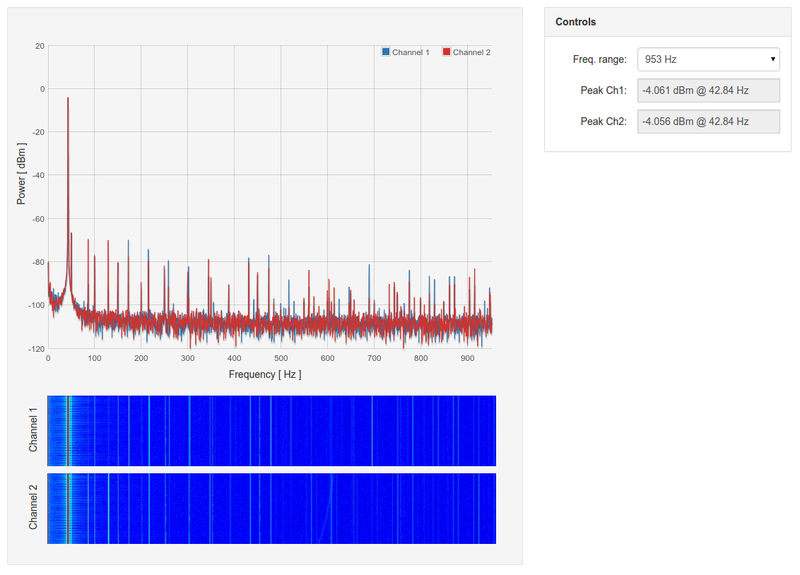 Using my new Red Pitaya to analyse the output, with a 43.066Hz Sine wave (1024 samples at 44.1kHz) the noise floor is 70dB down from the signal ex DAC. It seems the DAC performs as advertised. 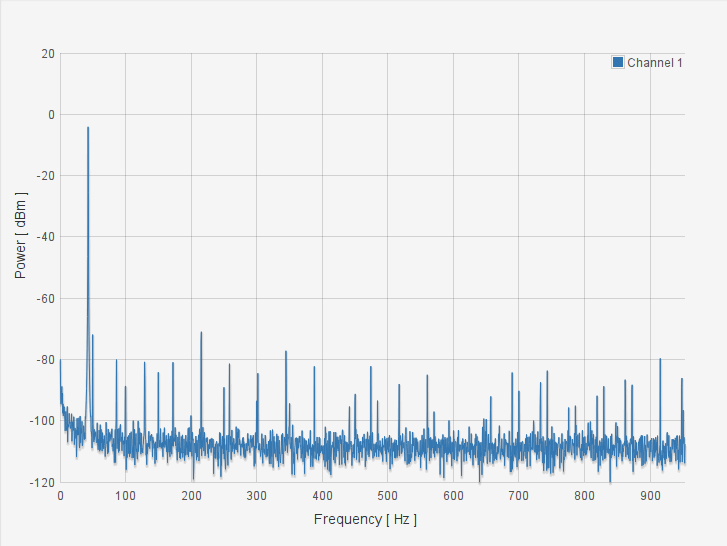 43.066Hz 12bit Sine wave, 1024 samples output at 44.1kHz. More in part two of Goldilocks Analogue – Testing. 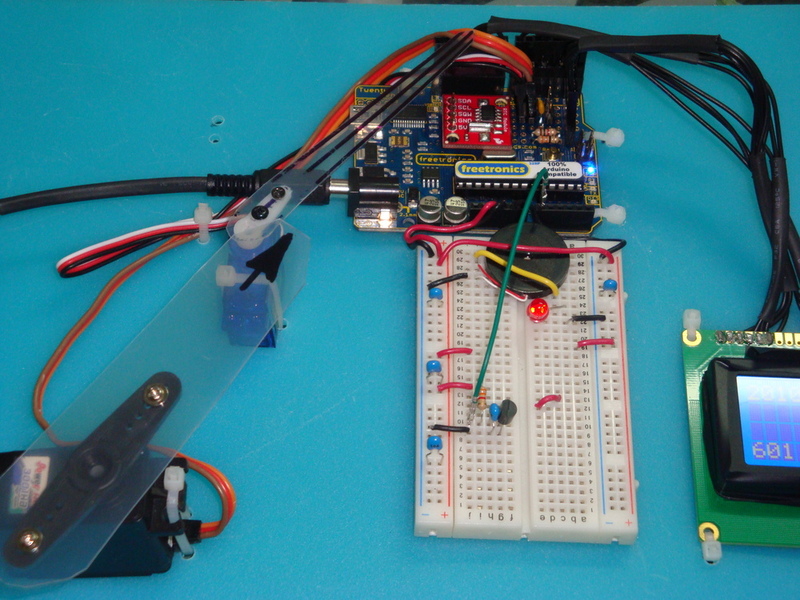 Part 2 of this project involved learning how to use hardware PWM to control servos. And, then to make the clock actually work with retrograde analogue hands. First the functional definition. A retrograde movement in horological terms is where the indicators or hands spring back to their home or 0 position at the end of their cycle. So for a minute hand, after 59 minutes and 59 seconds, its next movement would be to reverse move to home at 0 minutes. For the hour hand this could happen after 12 hours or 24 hours. 24 hours is the case that I have chosen to implement. The idea is to have the hour hand trace out a day from sunrise in the east, to vertical noon, and to set in the west. 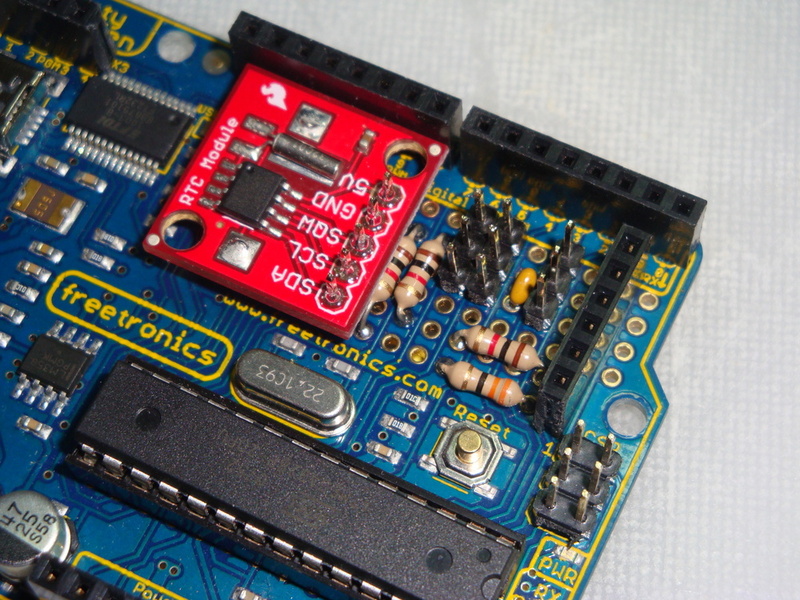 In part 1, I added the servo headers to align with the Arduino Digital Pins 5 & 6. 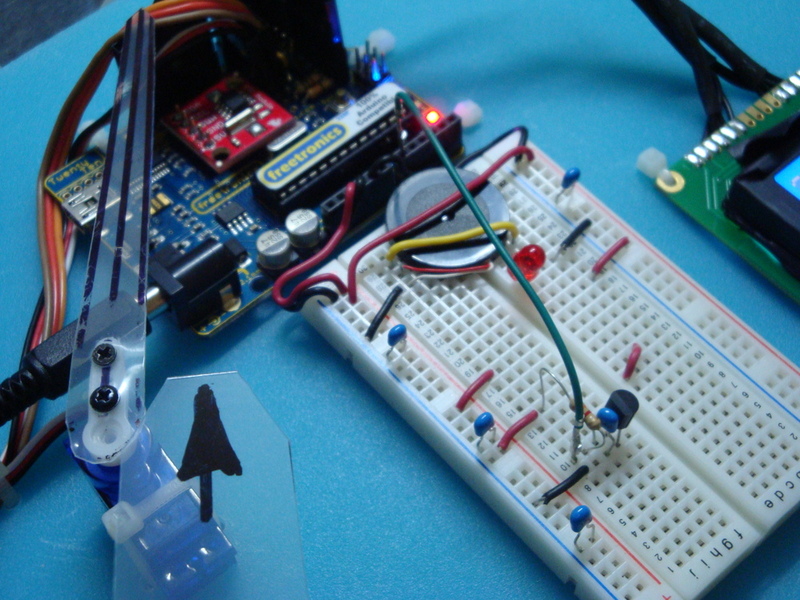 These pins are driven by the Timer 0 PWM hardware. Following quite a few evenings trying to understand how to generate PWM using the hardware (OK, I’m a bit slow), I realised that it is not very easy to get a good servo signal out of Timer 0 or Timer 2. 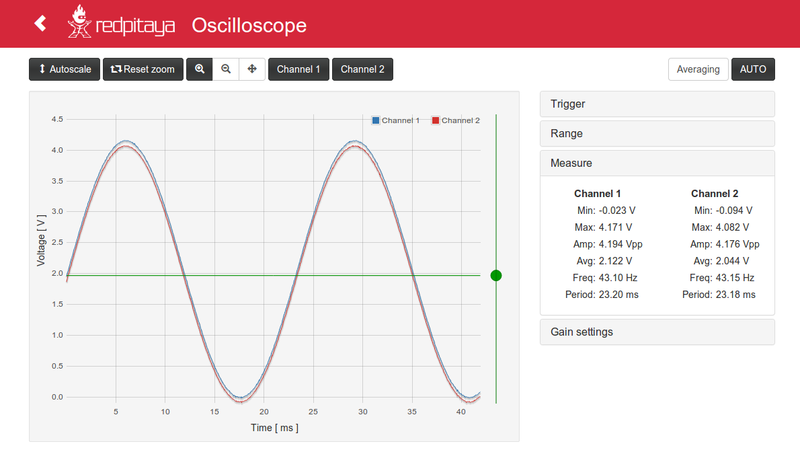 To generate the right signal for a servo, you need to produce a pulse every 20mS (50Hz). 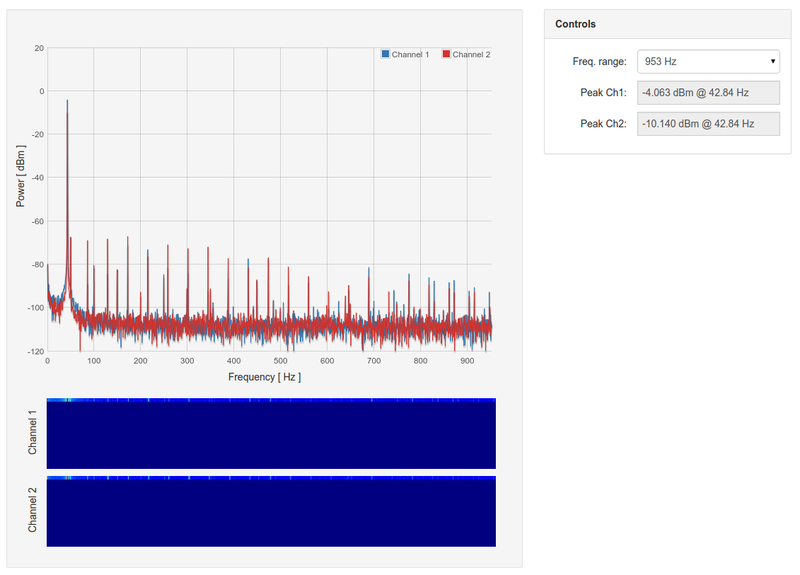 The width of the pulse should be 1.5mS to get the neutral position. Depending on the servo design, pulses with width from around 0.8mS to around 2.2mS (repeated every 20mS) will drive it to either end of its range. Depending on the servo, 0.8mS may drive it clockwise or anticlockwise. I have both in the clock. For example, the “hour” servo goes clockwise with a wider pulse. The “minute” servo is the reverse case. The main issue with Timer 0 and Timer 2 is that they are 8 bit timers, counting to 255 before resetting to 0 (ideally after 20mS). Since the required pulses are between 0.8mS and 2.2mS, there are only about 12 “positions” available for the servo to take. Not enough to allow a minute hand to indicate 60 different positions. Therefore it became clear that, for this application, it was only possible to use the 16 bit Timer 1 to control the servos. Setting up Timer 1 is relatively easy, once that decision had been made, so the code was implemented. But, this meant that I had to reconnect the servo headers to Arduino Digital Pin 9 and Pin 10, which are driven by the Timer 1 PWM hardware. Also, in the pictures below, I have added a header to allow power, LCD backlight (32Ohm), and contrast (1kOhm), connections to the standardised HD44780 LCD. Ok, so here’s the issue. 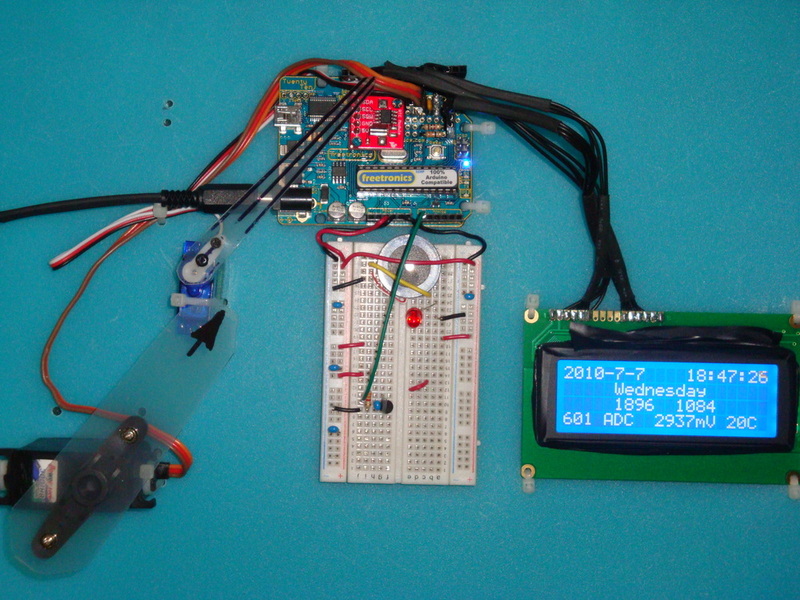 I’m using the Pololu Libraries for writing to the LCD, and the standard connection for the data line 4 on the HD44780 LCD goes to Arduino Pin 9. 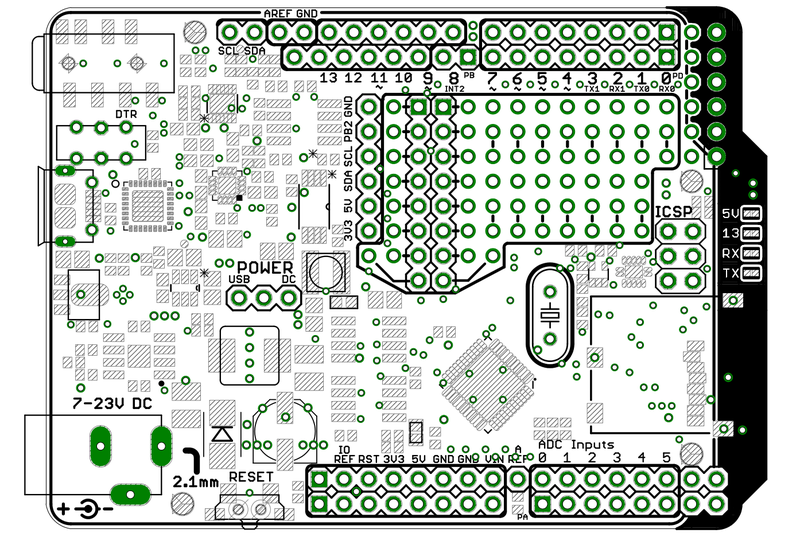 The same pin I need for the Timer 1 PWM. Ouch. Modifying the library is not too difficult. We can move the Data line attached to Pin 9 onto Pin 11, and all is well. This is done in the following file. #define LCD_DB4 PORTB3 // Was PORTB1. Use PORTB3 to avoid the Timer1 pins. // LCD Data: 2 1 0 Use DB3 to avoid Timer1 pins. 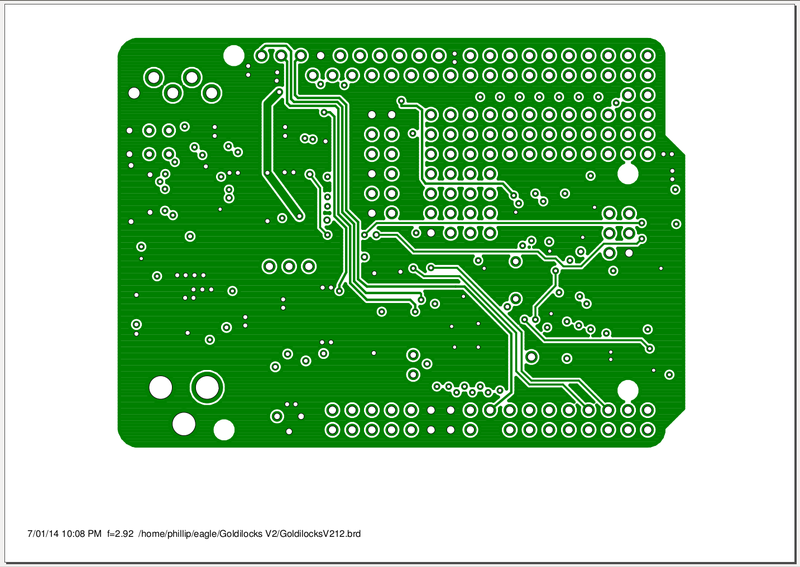 The below pictures show the LCD pin layout. 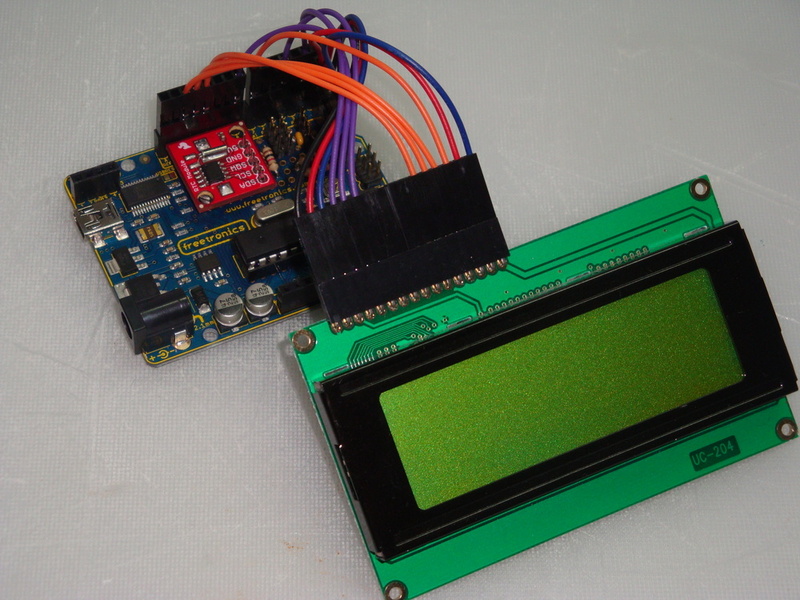 So now we have PWM for our retrograde analogue hands, and a LCD display. There’s too much display going to waste, so let’s add something else… Hmm… Temperature, and time, make a min/max thermometer that can show what time each extreme temperature was reached during the day. Quickly getting a LM335Z temperature sensor, I’m now testing whether the 10bit ADC is good enough to generate reasonable temperature readings from the device. At full range of 5000mV across 1024 levels, we have about 4.88mV per level. The LM355Z produces 10mV per degree, so we should be able to get 0.5 degree accuracy. If everything is perfect. 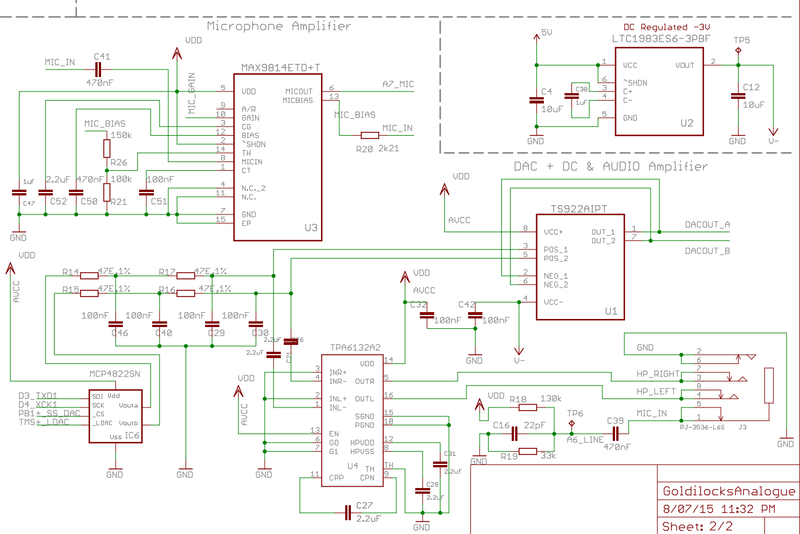 I was not happy with using resistors to tie up the SCL and SDA lines high for the I2C bus, as it should be possible to use the internal pull up resistors in some situations (according to the Atmel datasheet). 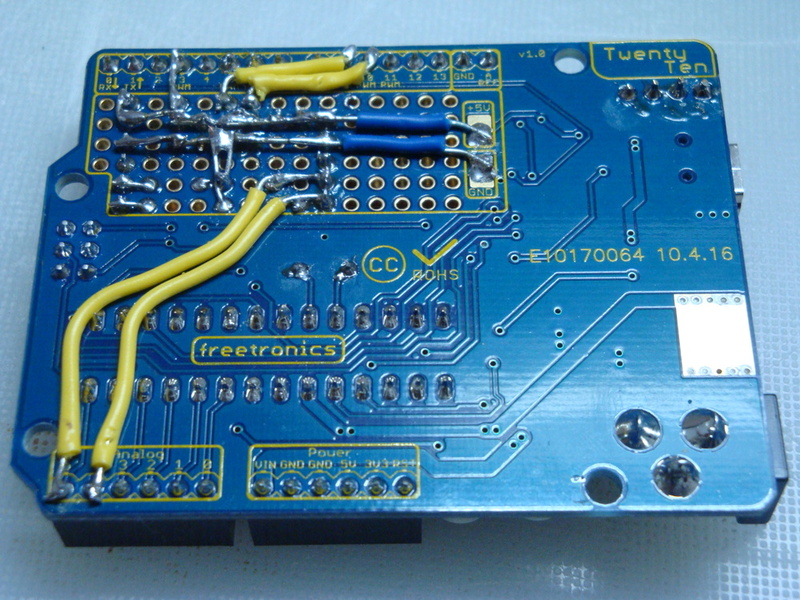 So using a new Freetronics 2010 from Little Bird Electronics, the clock is now rebuilt without external pull up resistors. 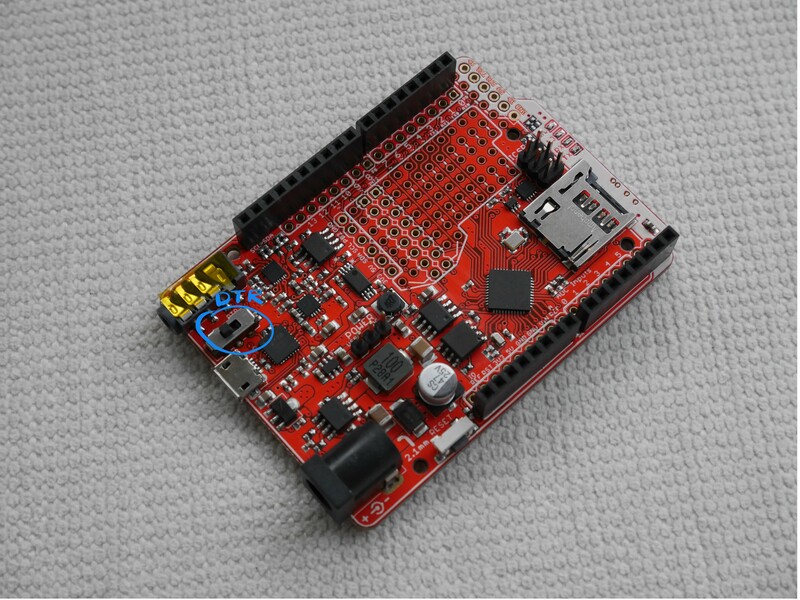 The I2C code is modified to only pull up the lines between the start and stop bus instructions. 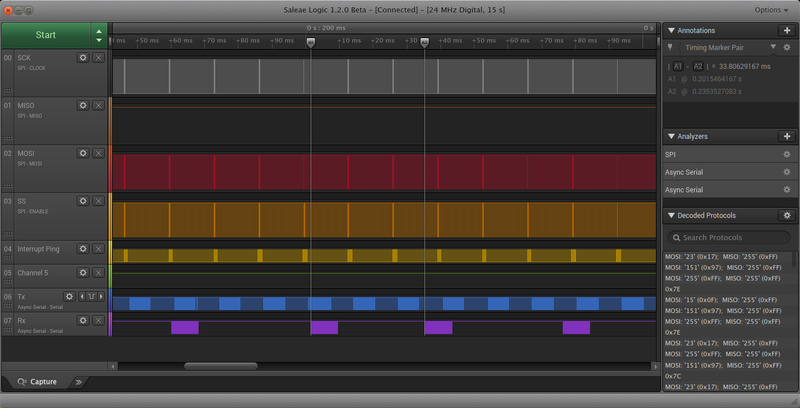 The levels are messy (not showing sharp transitions in my SLO) but, never the less the code and the clock works. The working device is shown below. Note the rather funky white on blue display I got from Sparkfun. In the years since this instruction was writen, I’ve migrated to Github. So the code is hosted here. The freeRTOS code is also posted on Github. I used the Pololu Library for writing to the display, so it needs to be installed along with the normal AVR libraries.